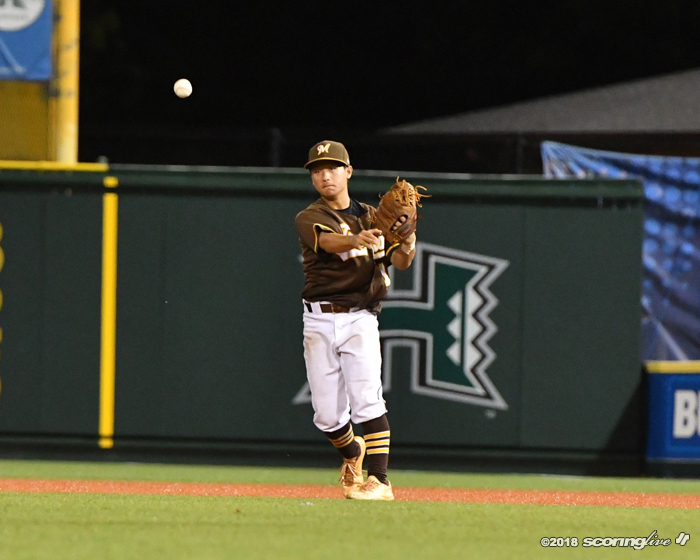 MANOA — Sophomores Jayton Pang and Vance Oshiro combined for 3 2/3 innings of scoreless relief and Mililani rallied to a 6-5 win against No. 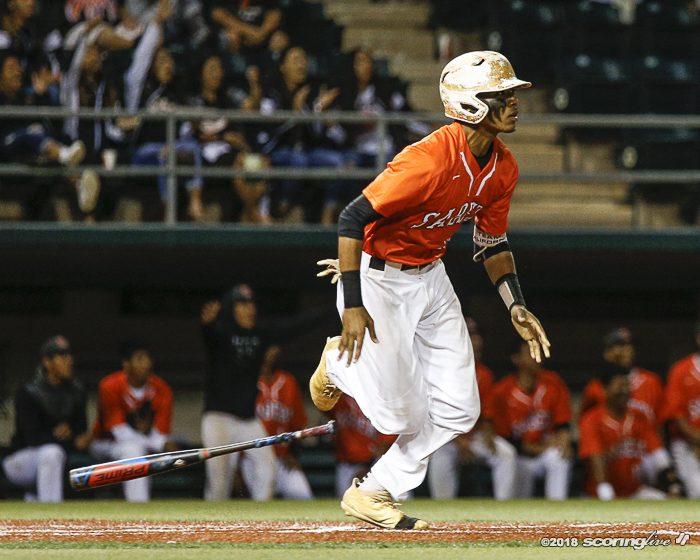 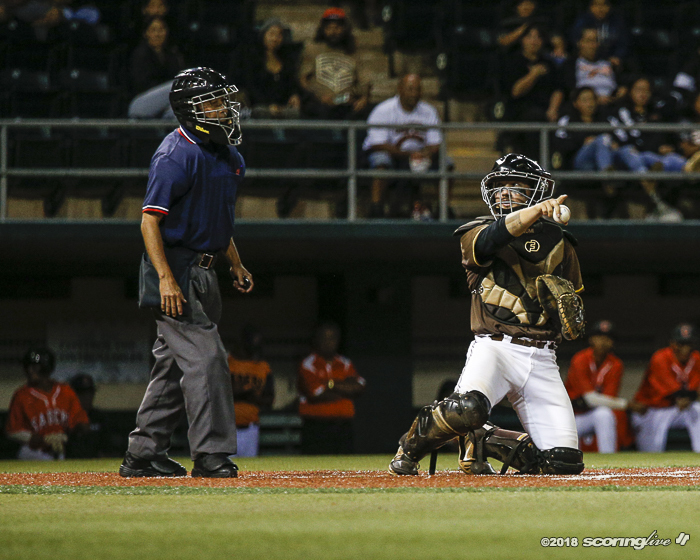 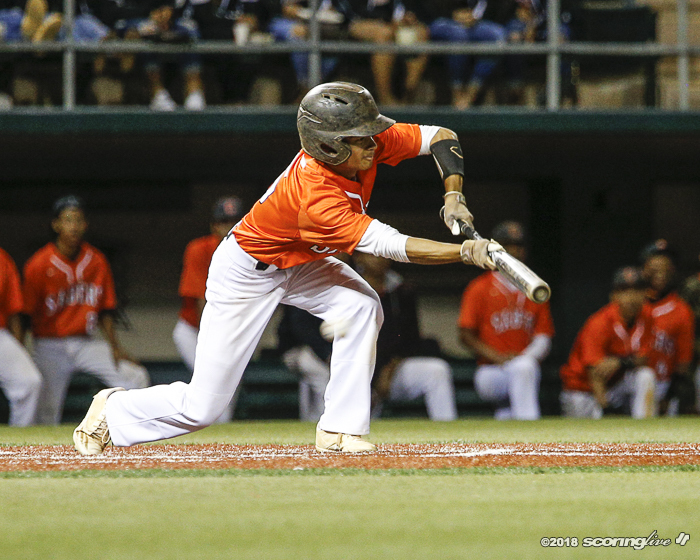 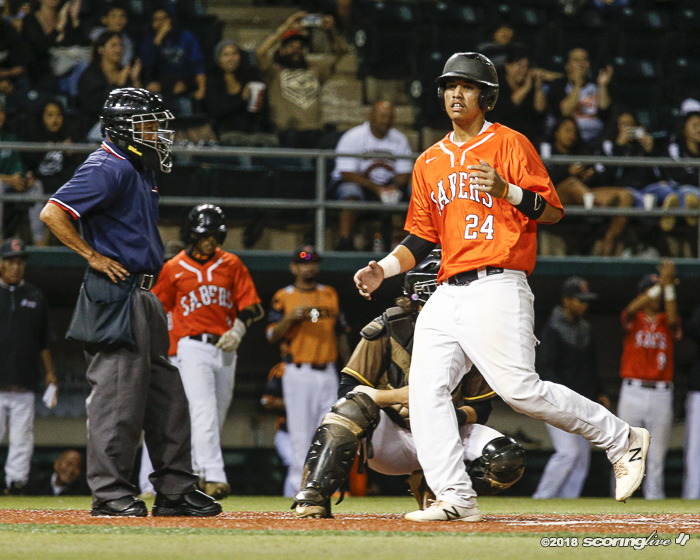 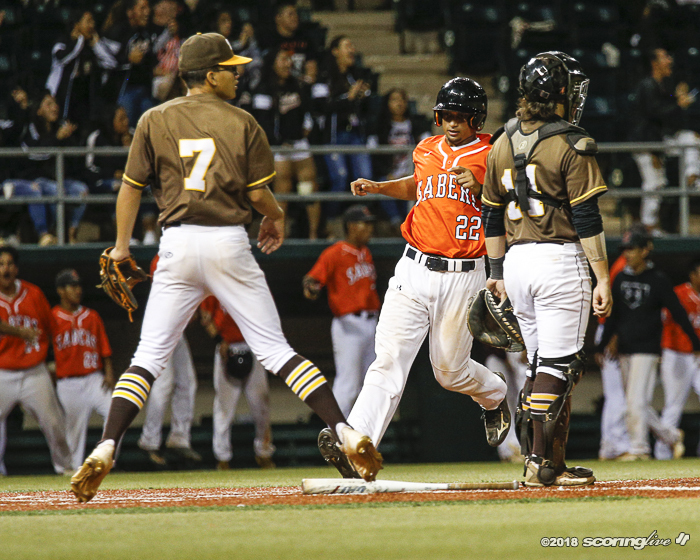 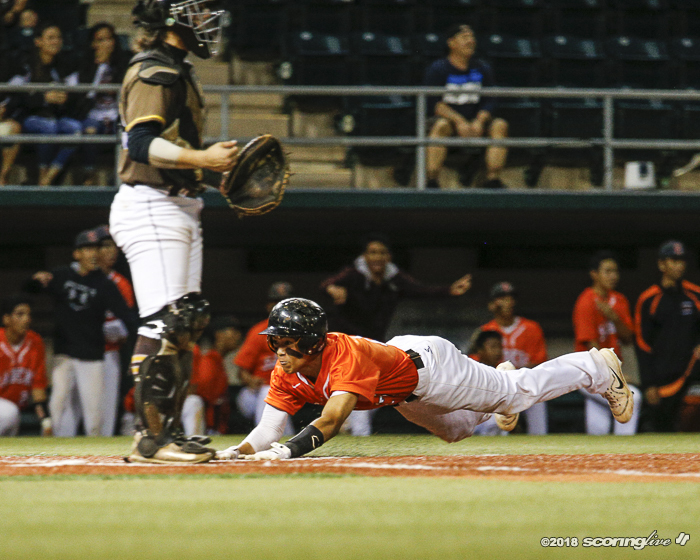 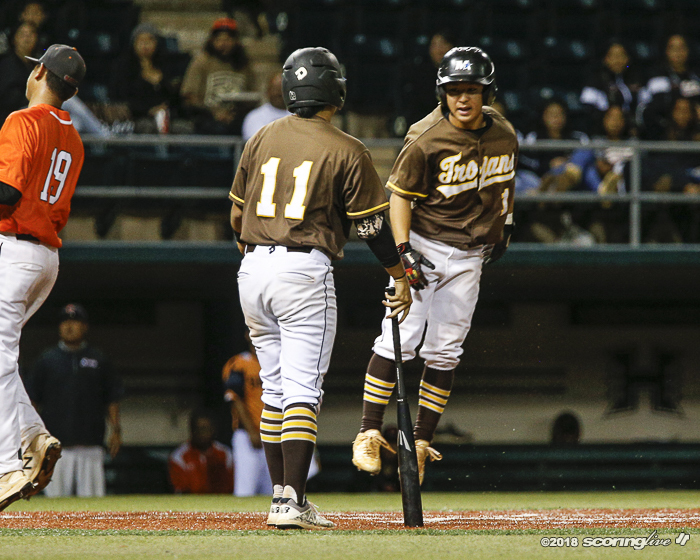 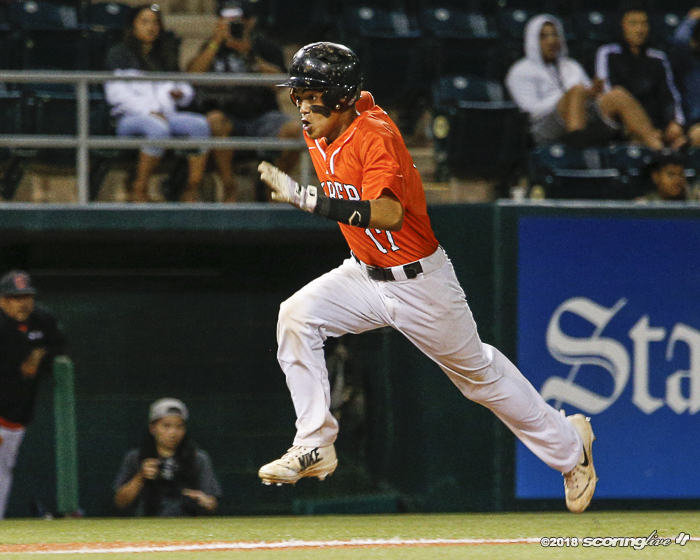 3 Campbell Friday in the semifinals of the Oahu Interscholastic Association Division I tournament. 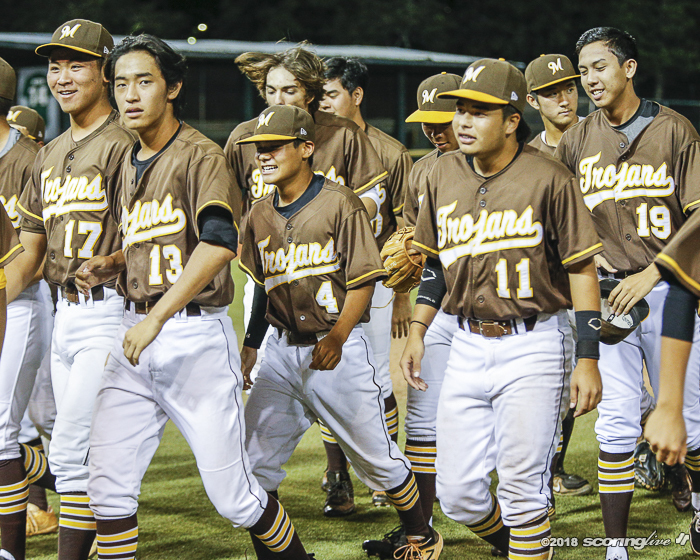 The Trojans (11-4) will play No. 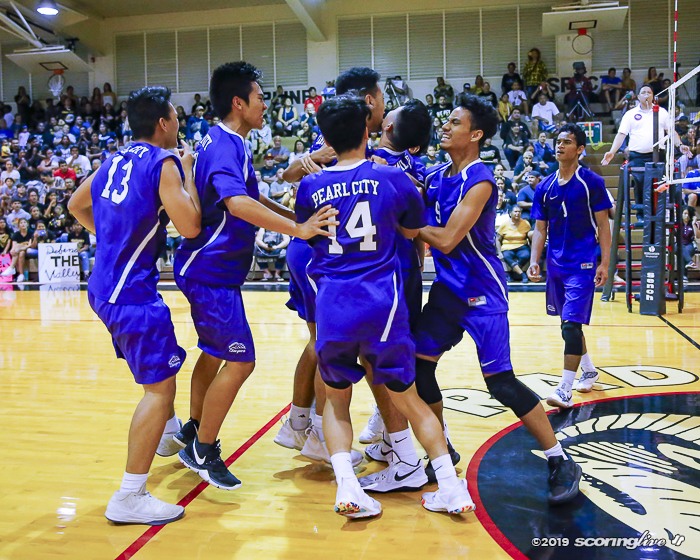 7 two-time defending OIA champion Kailua, 6 p.m. Saturday for the league title and seeded berth for the Division I state tourtnament. 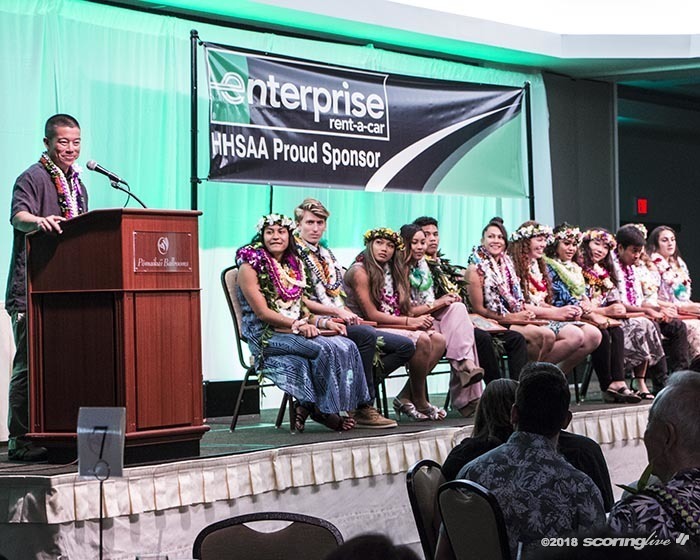 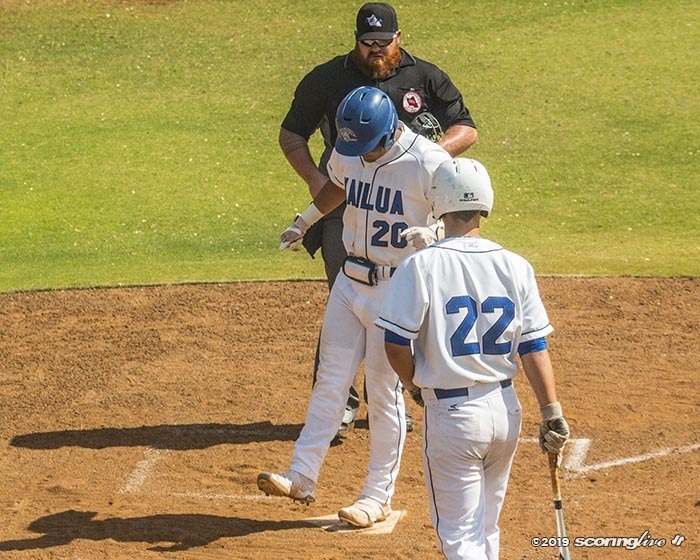 The Surfriders (12-2) will be looking for their 15th OIA crown, while the Trojans are seeking their first since 1997. 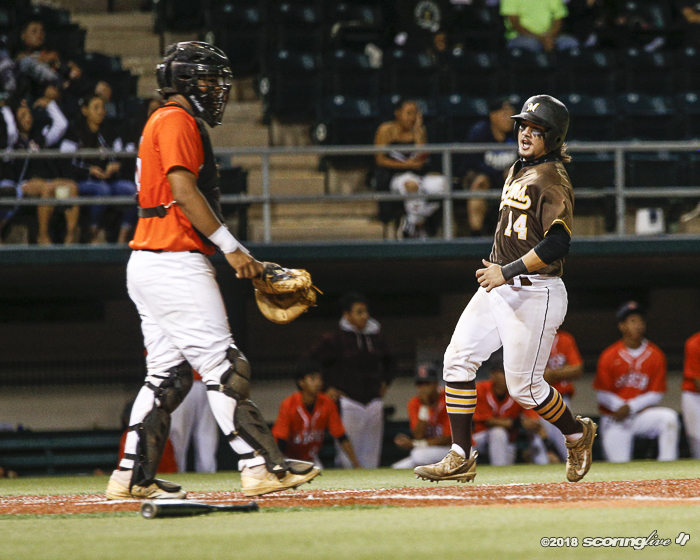 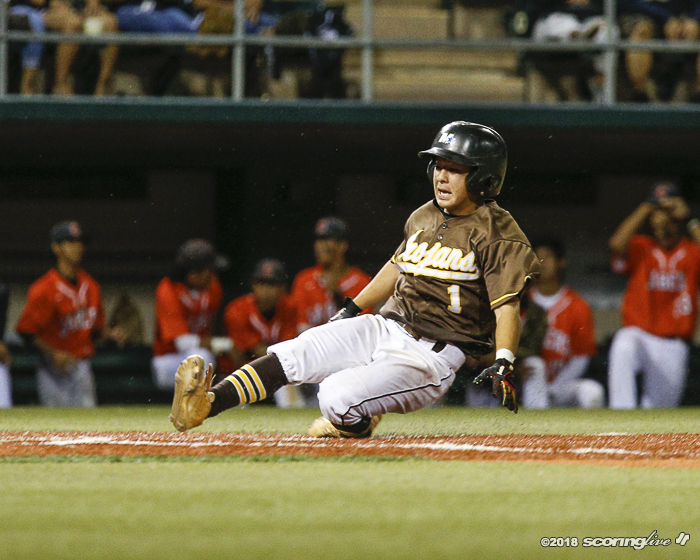 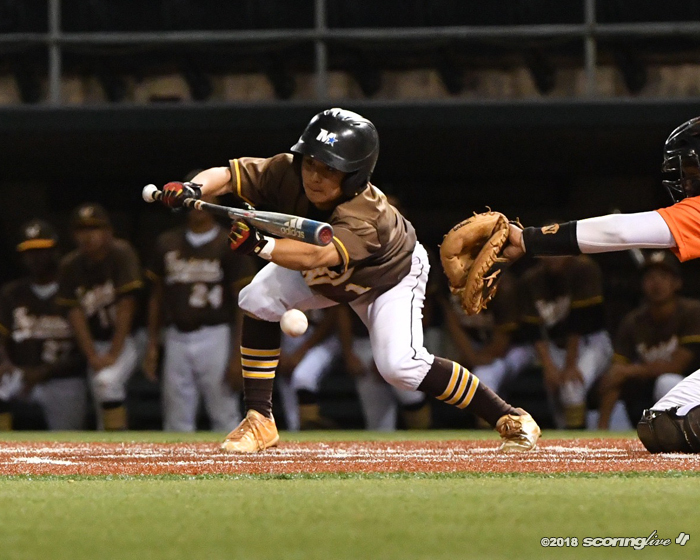 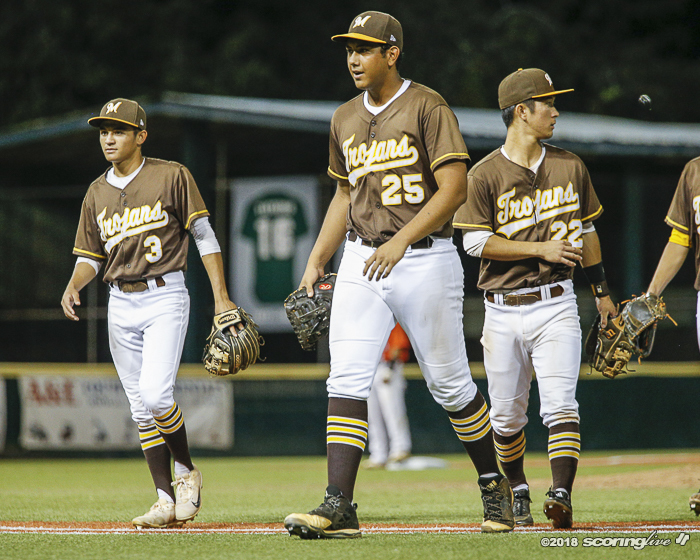 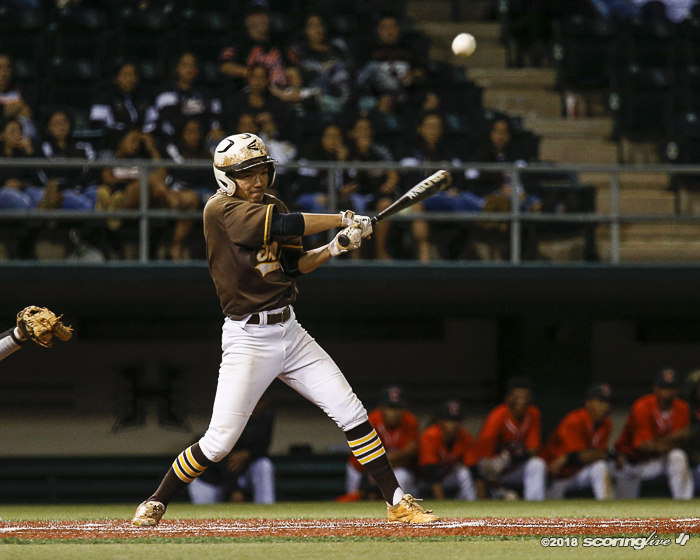 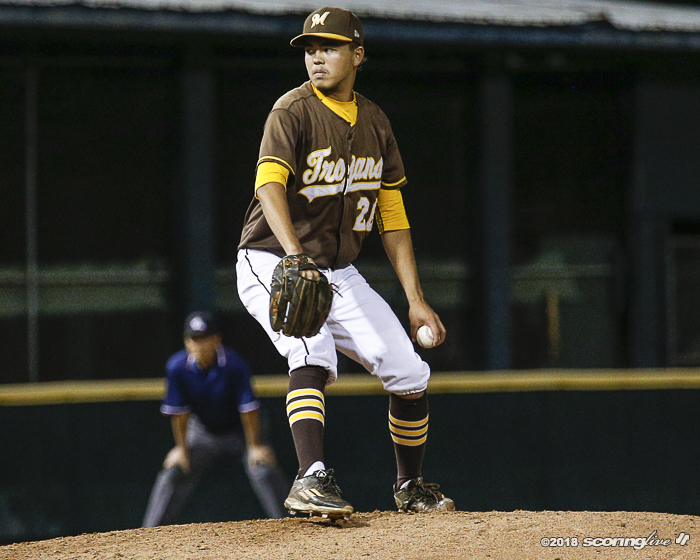 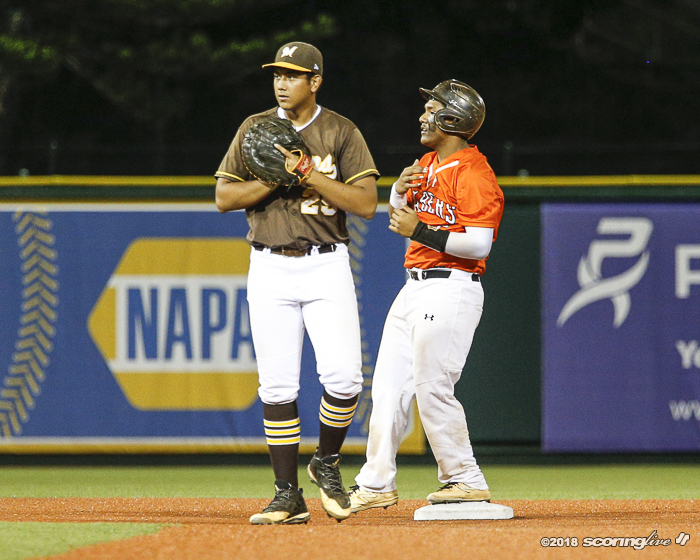 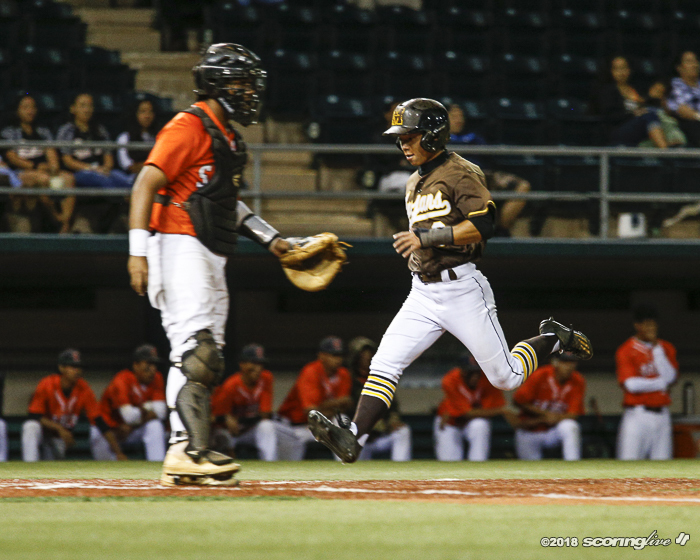 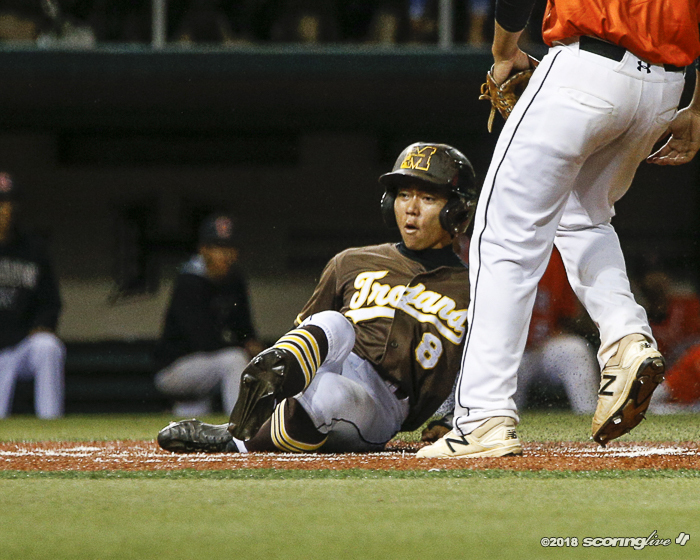 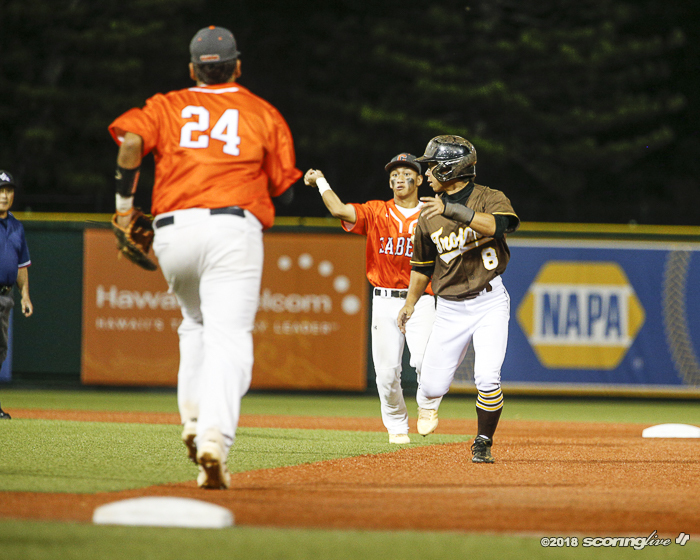 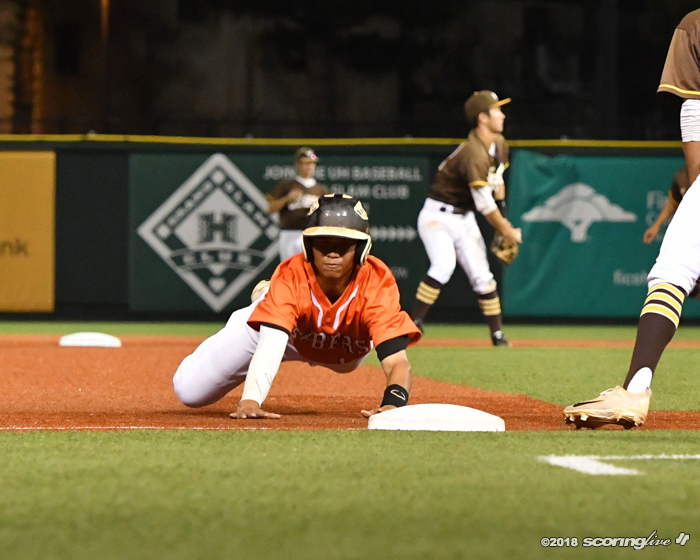 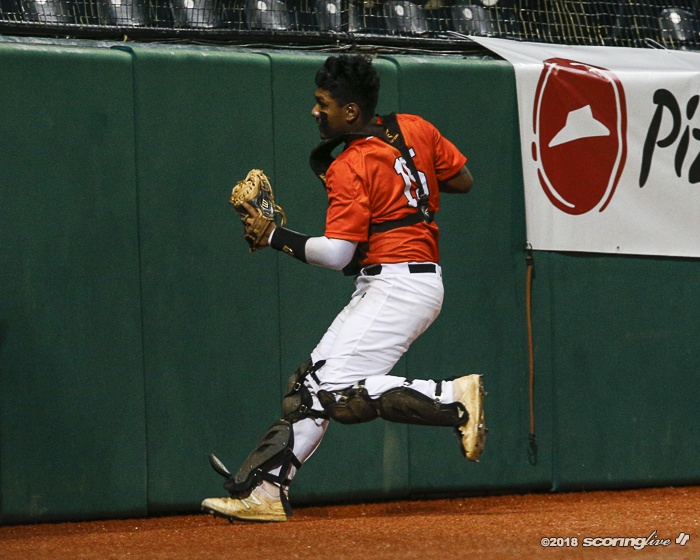 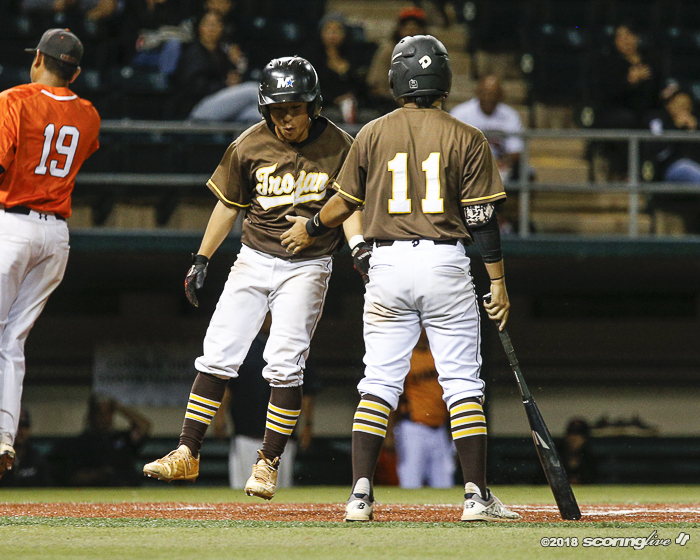 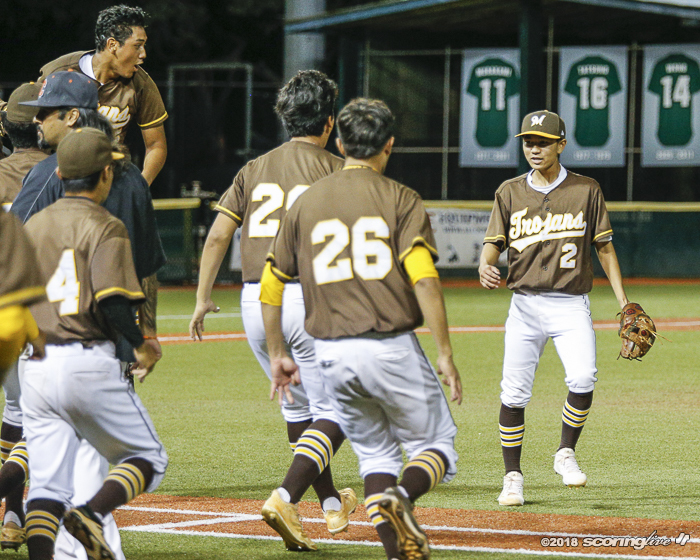 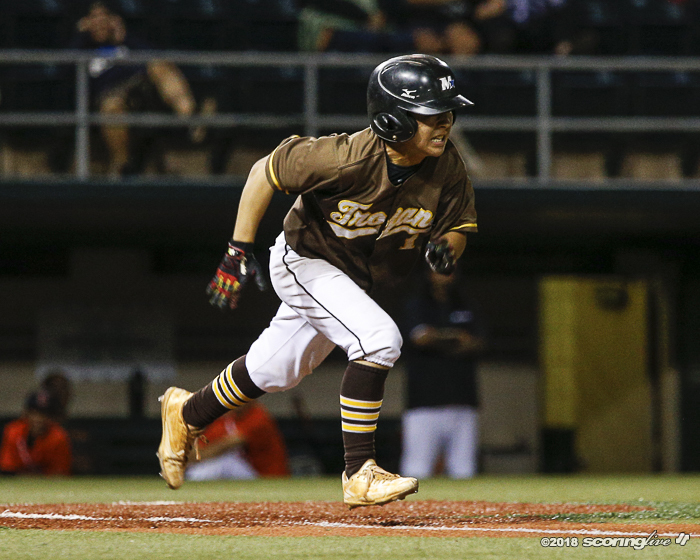 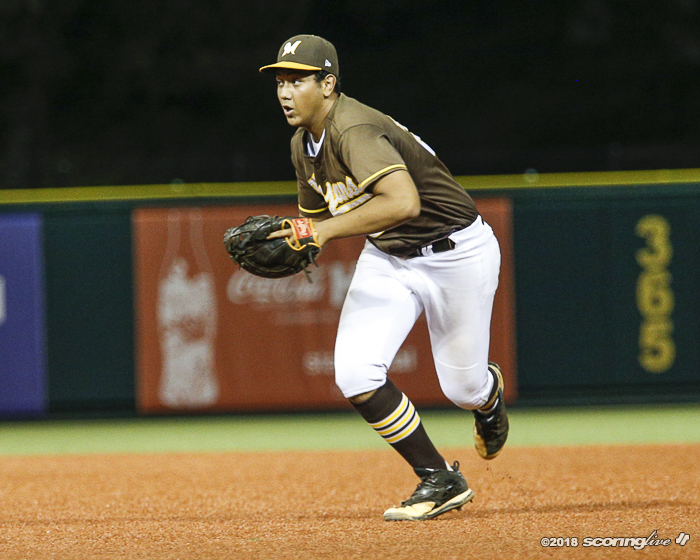 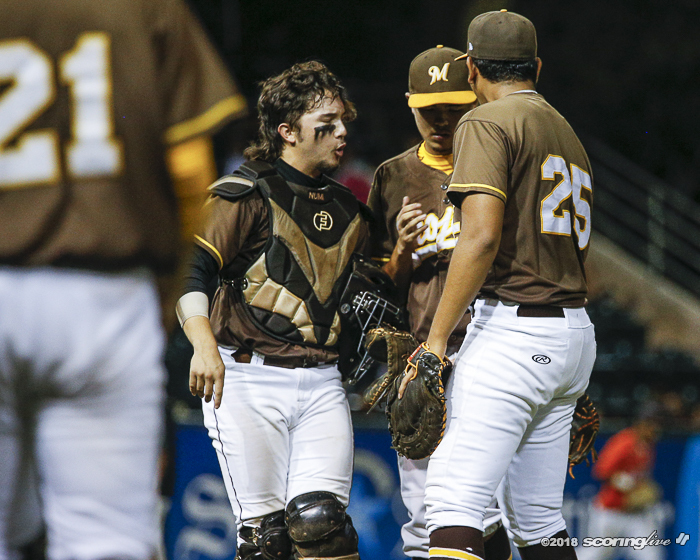 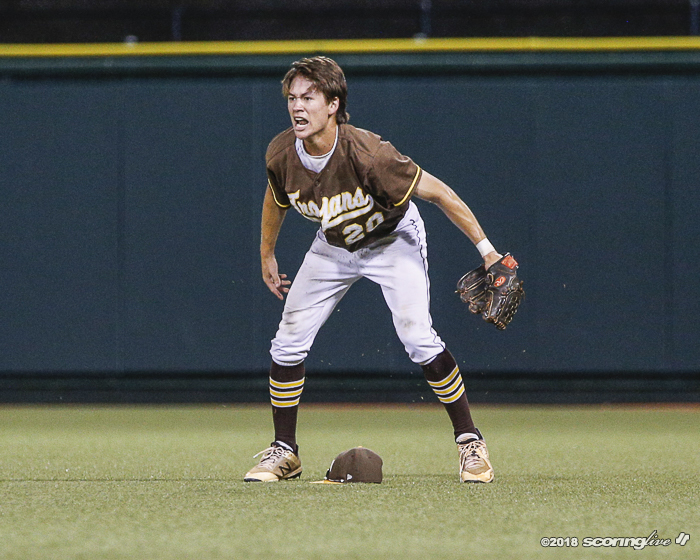 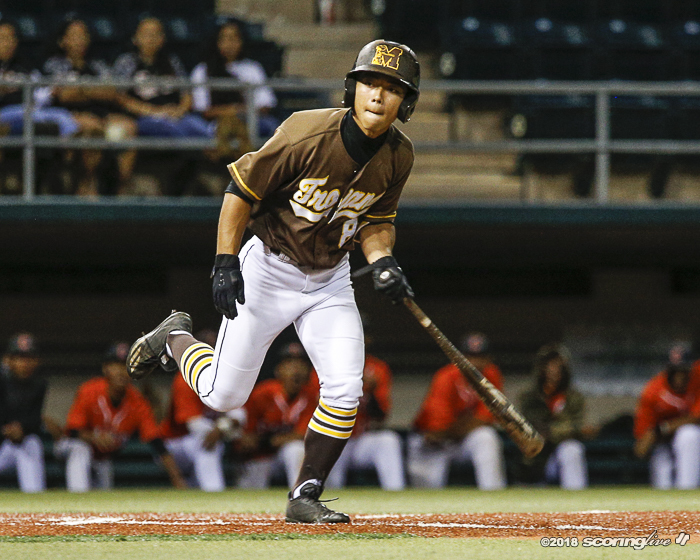 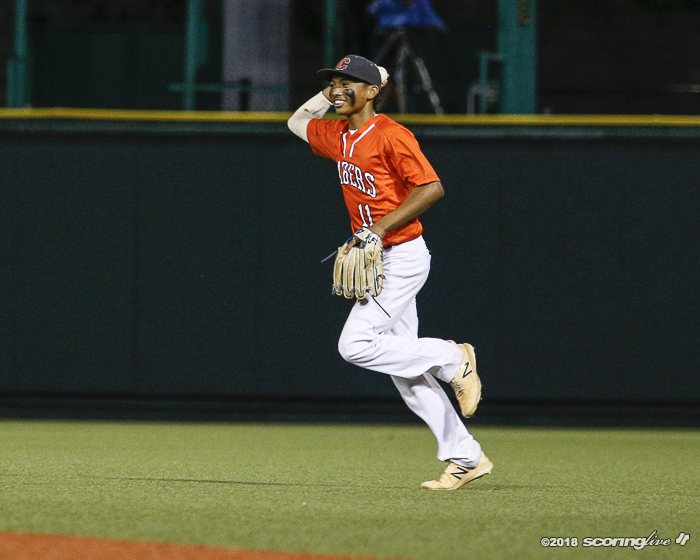 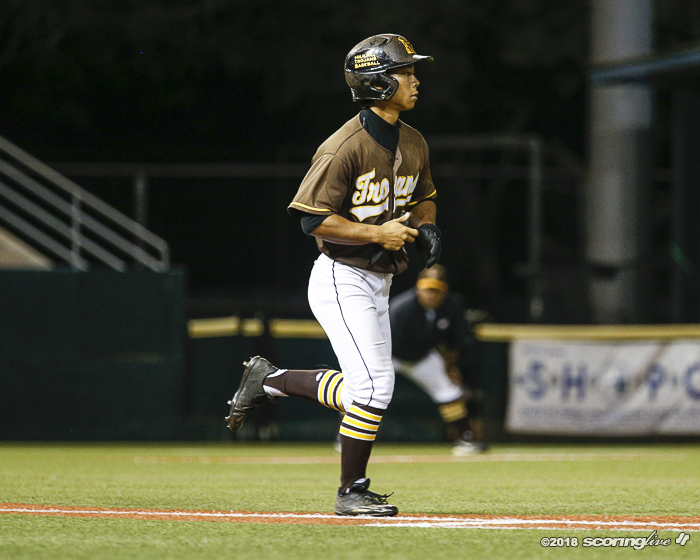 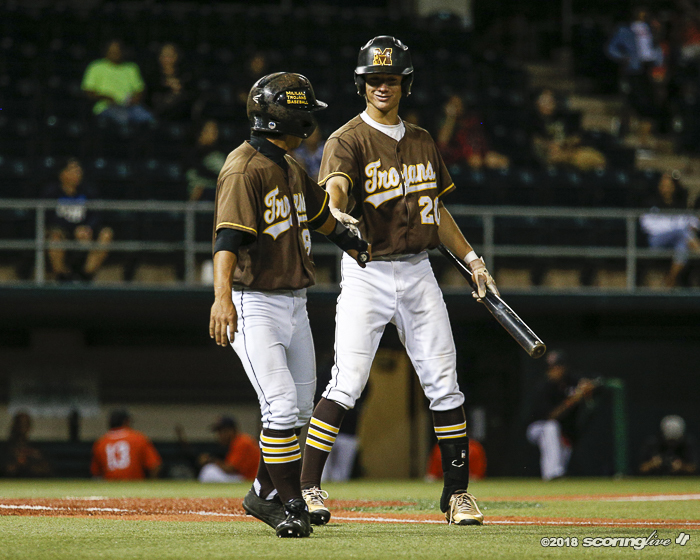 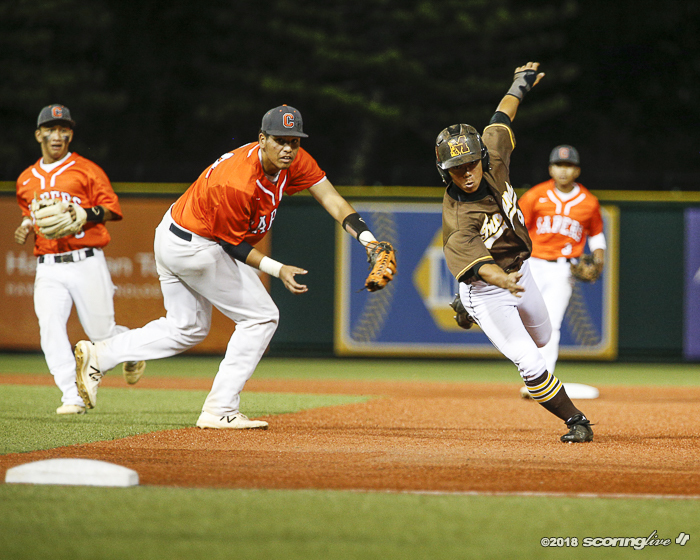 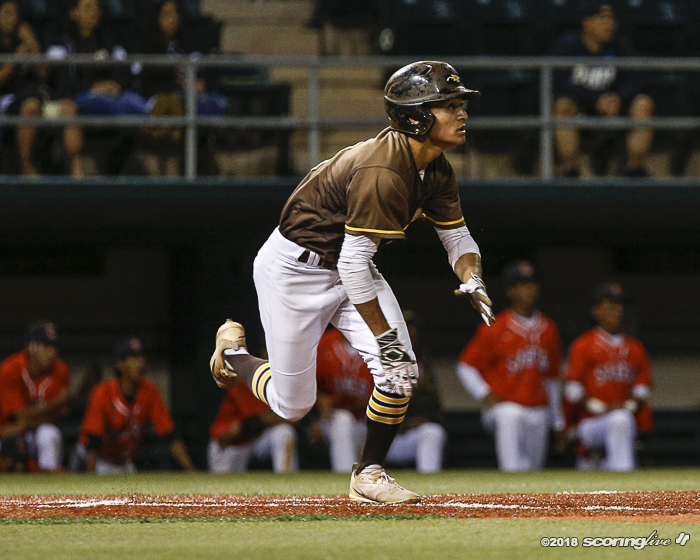 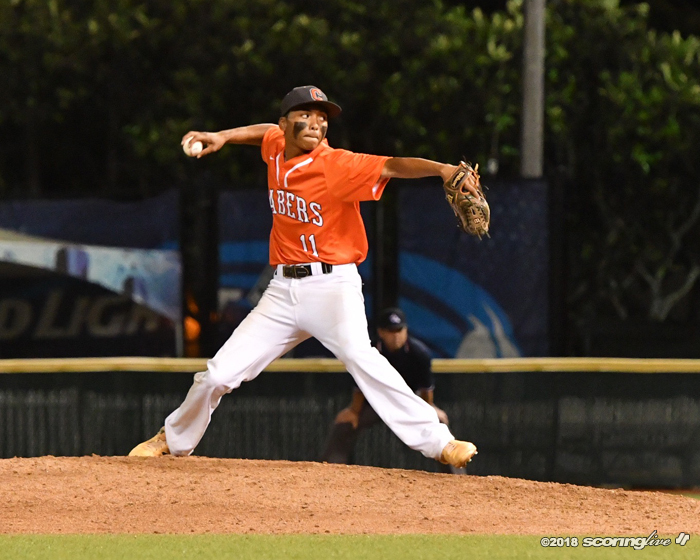 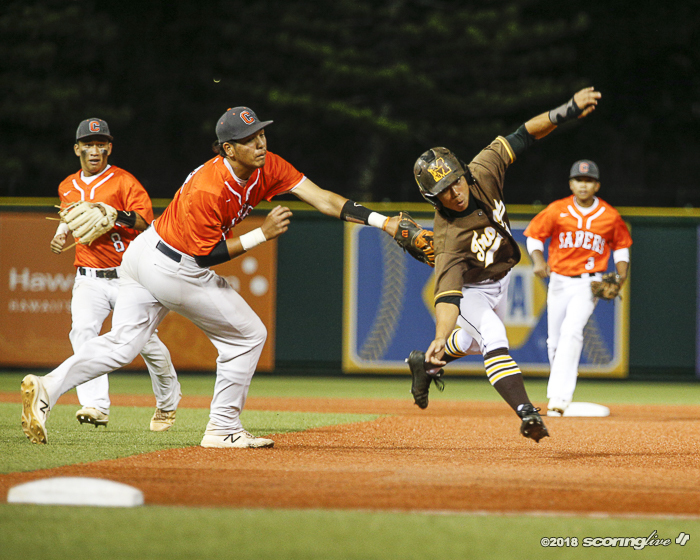 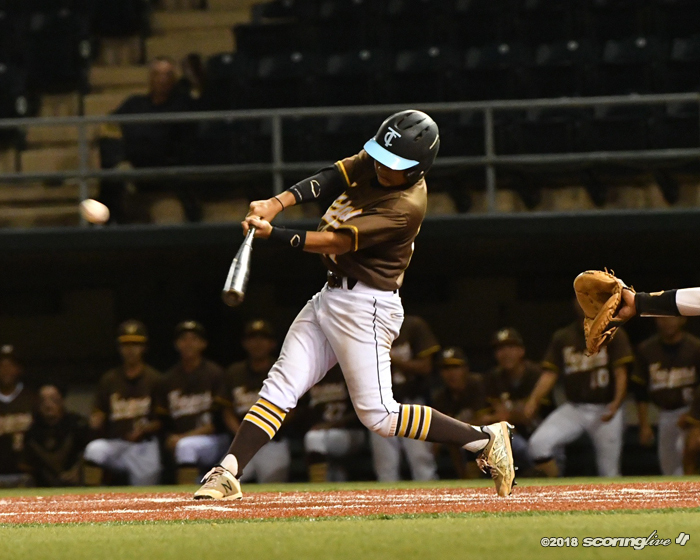 Mililani, in its third consecutive day in the tournament, sent the kiddie corp on the hill at Les Murakami Stadium starting with freshman left-hander Anu Reis, who lasted 3 1/3 innings but walked five and was charged with five runs. 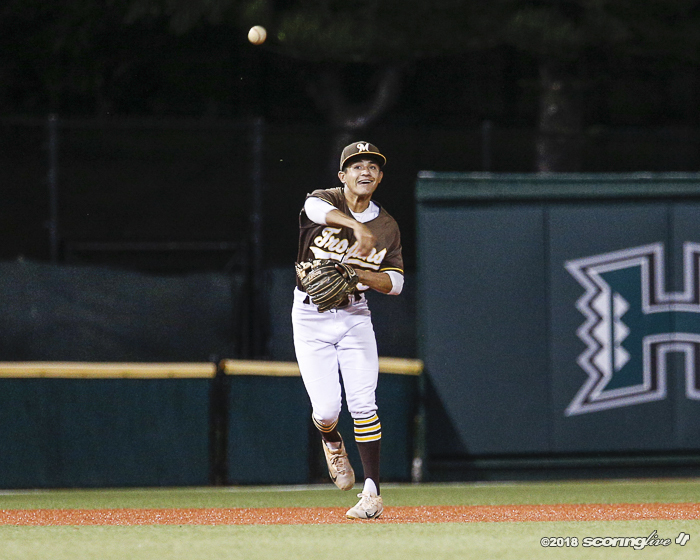 Pang, a sophomore, picked up for Reis with one out and runners at second and third in the fourth with the game tied at 3. 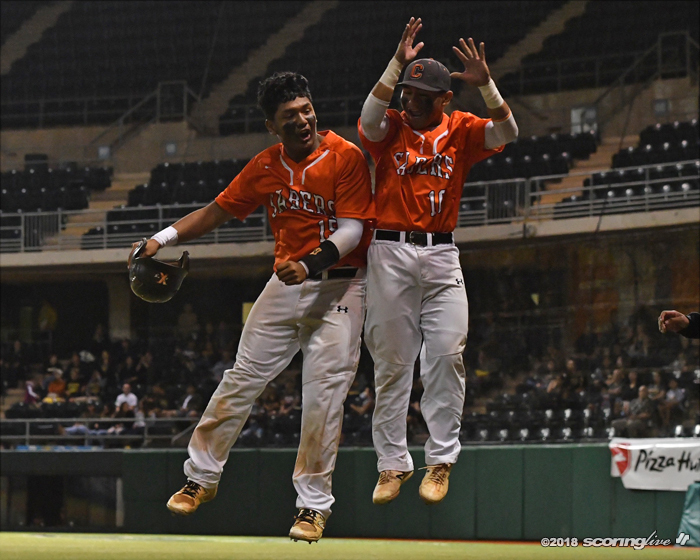 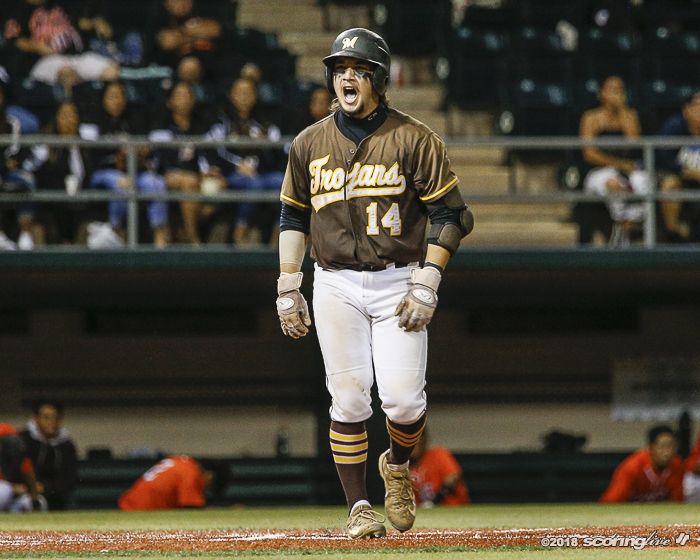 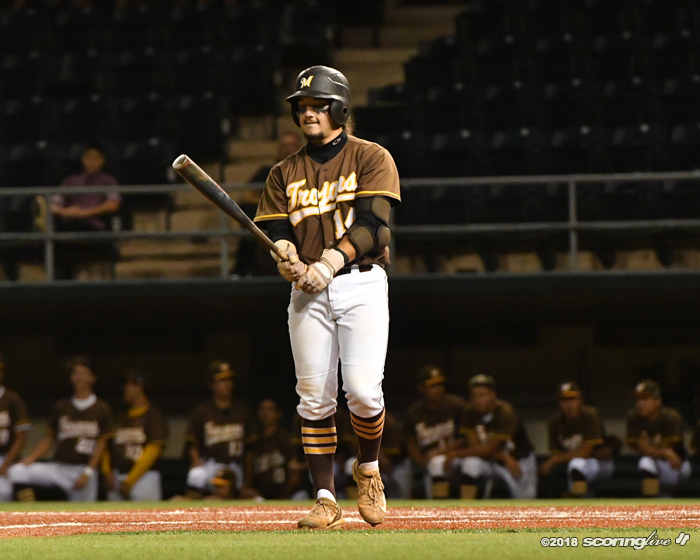 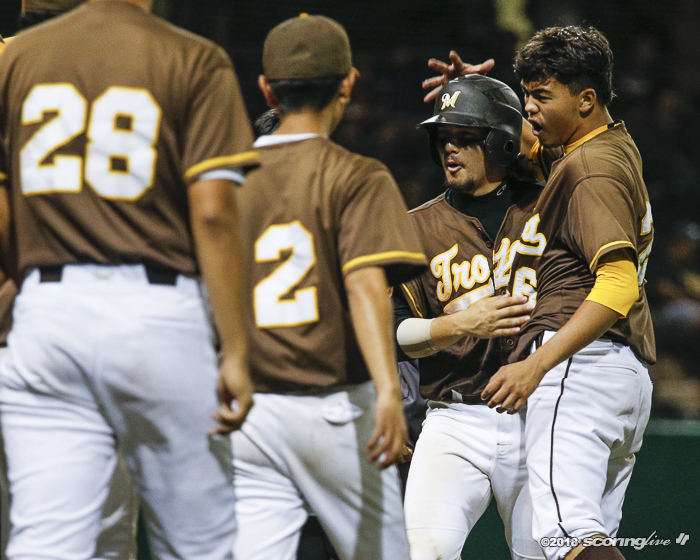 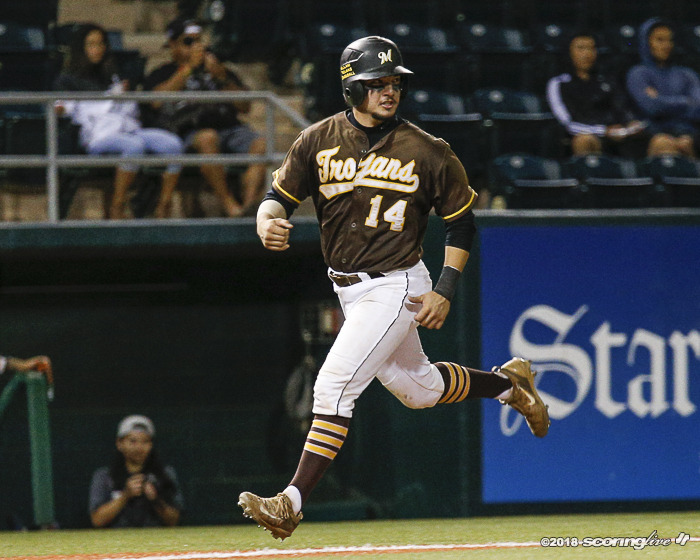 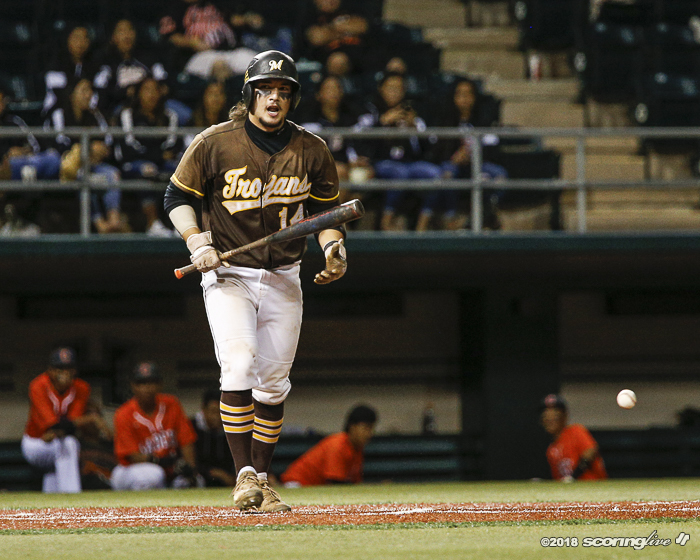 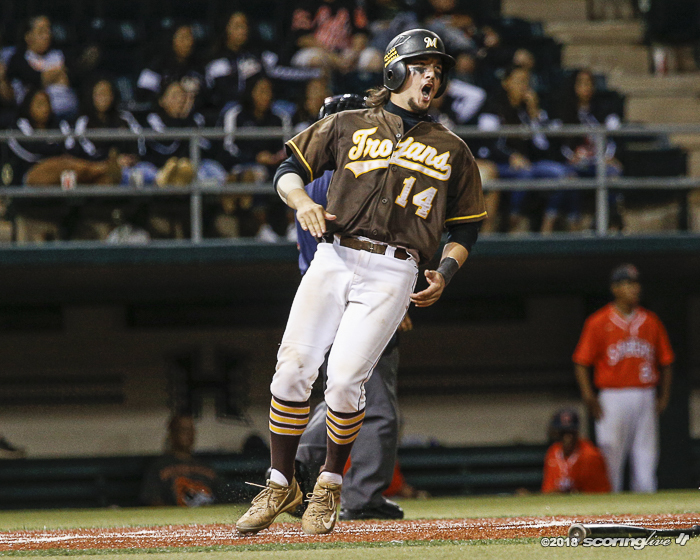 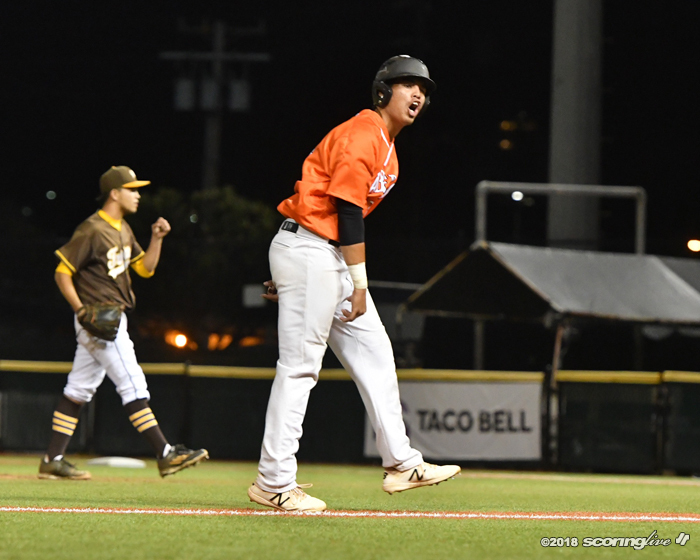 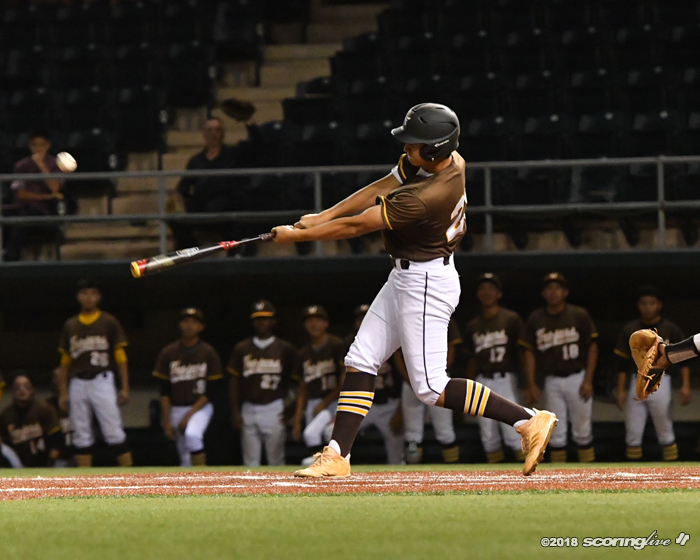 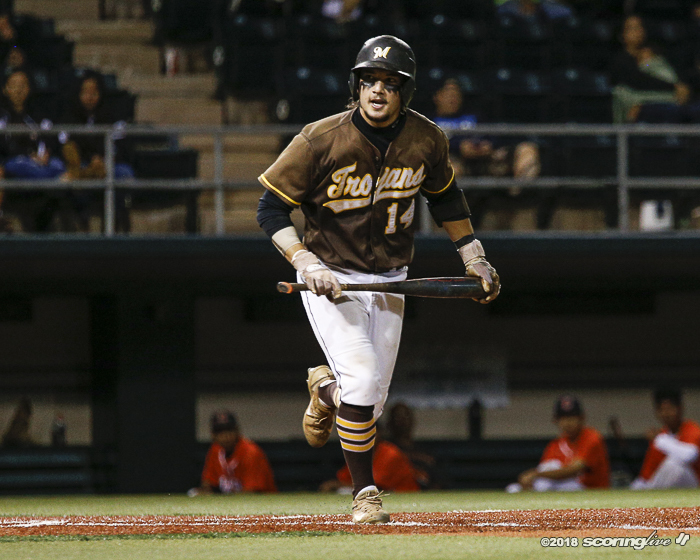 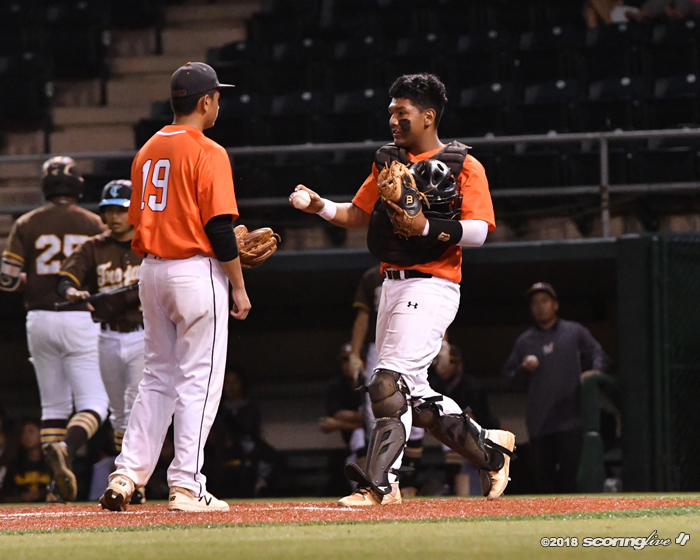 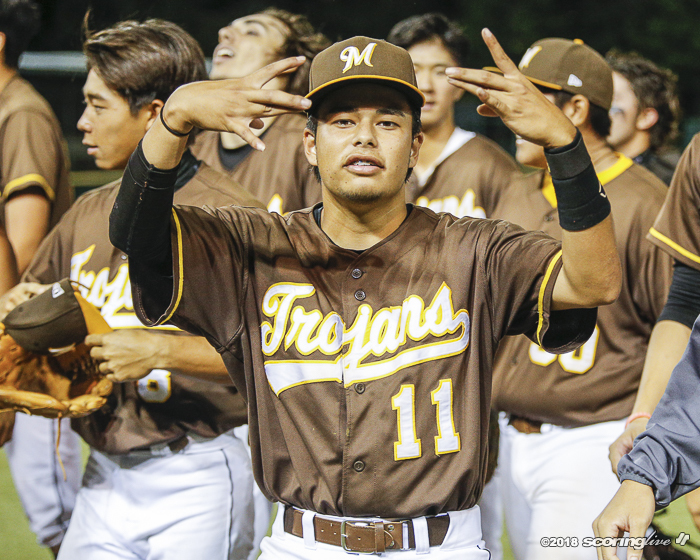 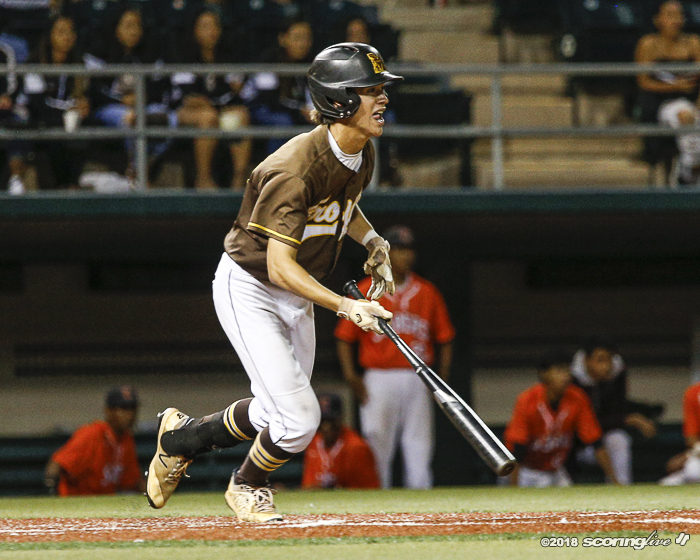 After allowing a two-run double to Dylan Ramon to put Campbell ahead, 5-3, Pang retired the next two batters and was the beneficiary of the Trojans' three-run fifth that pulled Mililani up, 6-5. 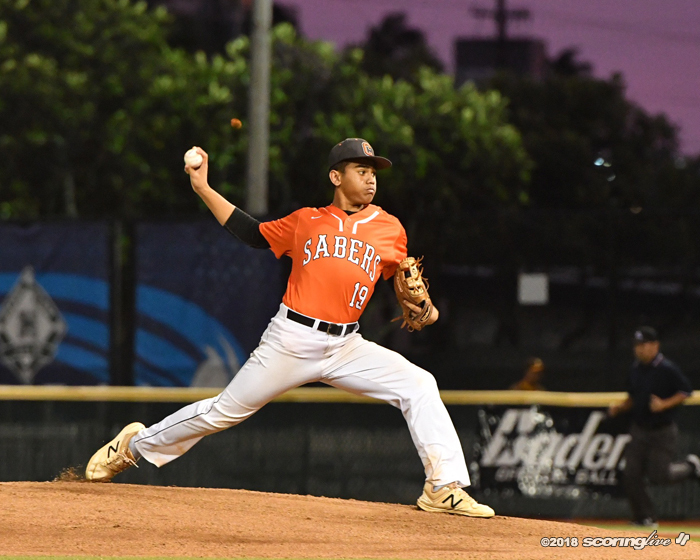 Oshiro then shut the door on the Sabers, who had beat the Trojans twice during the regular season. 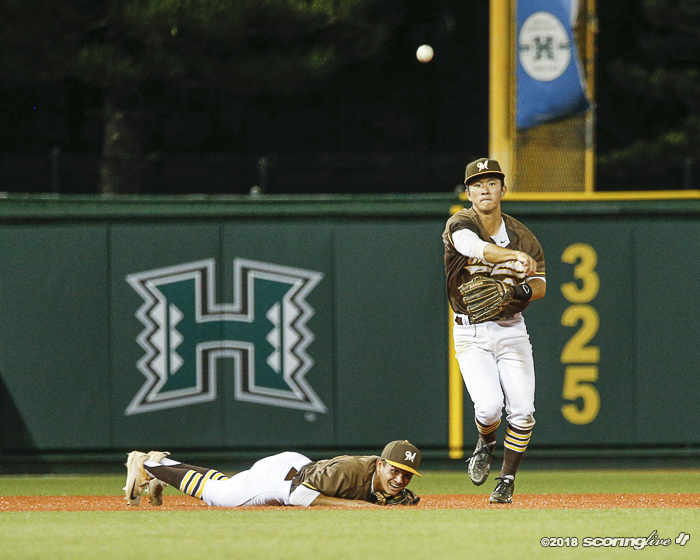 He retired nine of the last 10 batters with the only runner allowed came on a fielding error. 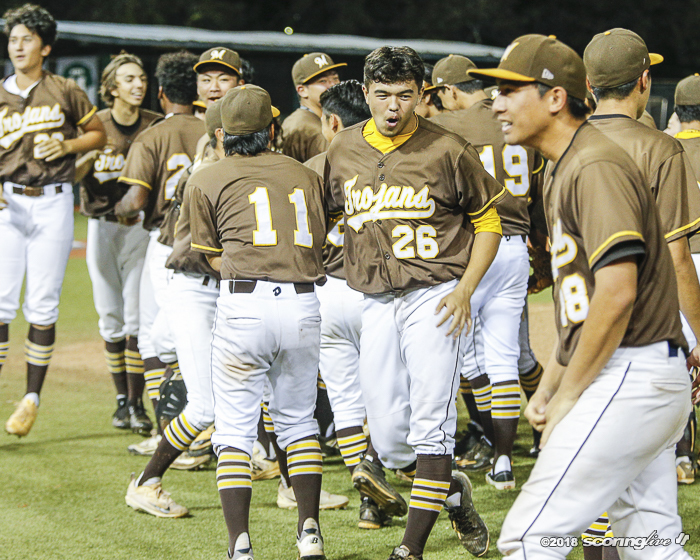 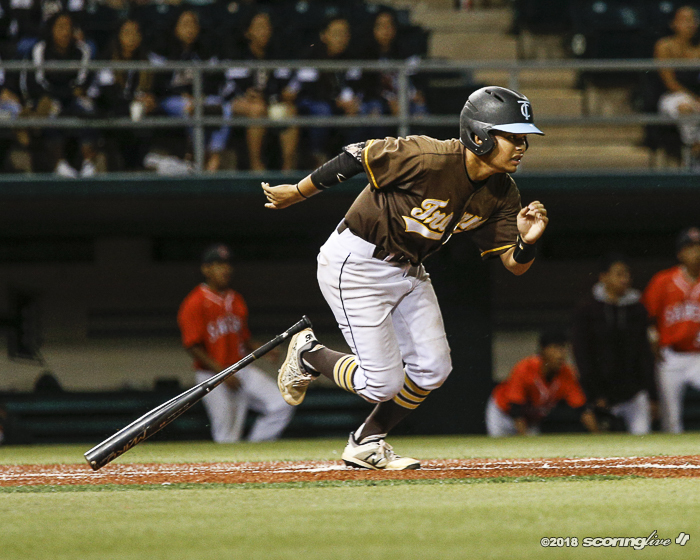 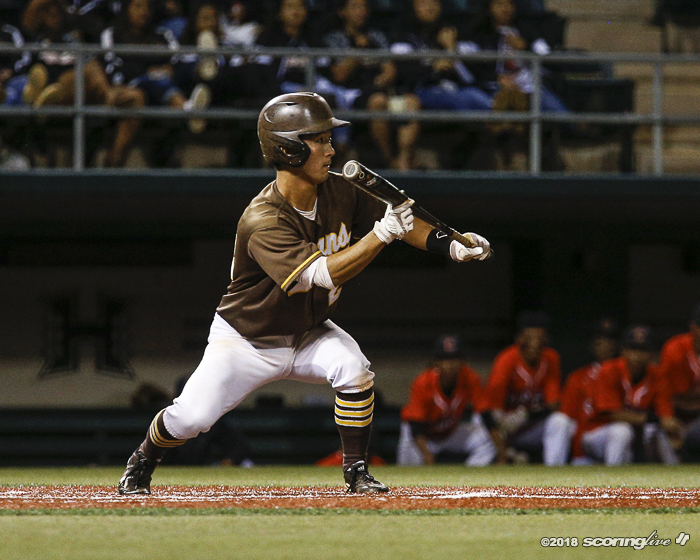 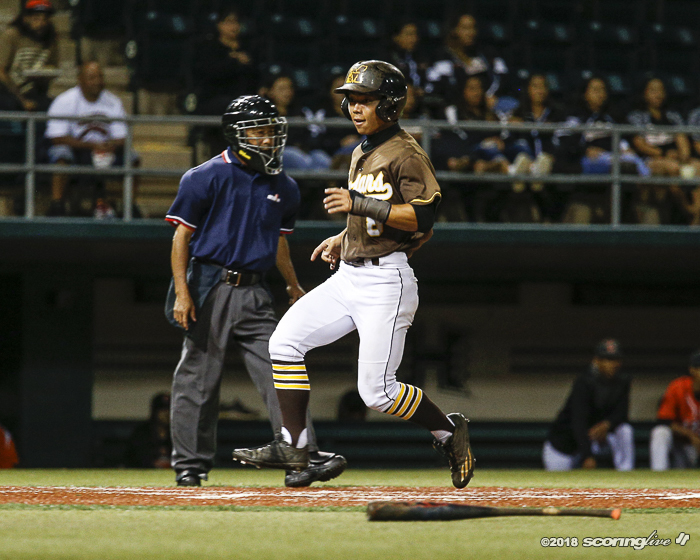 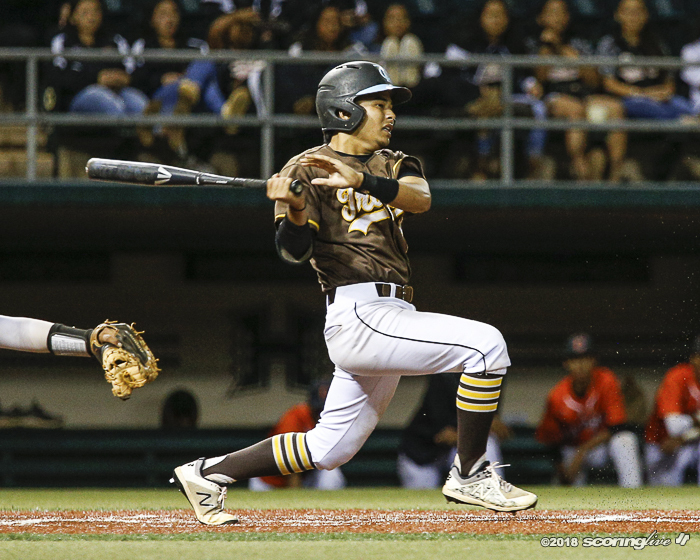 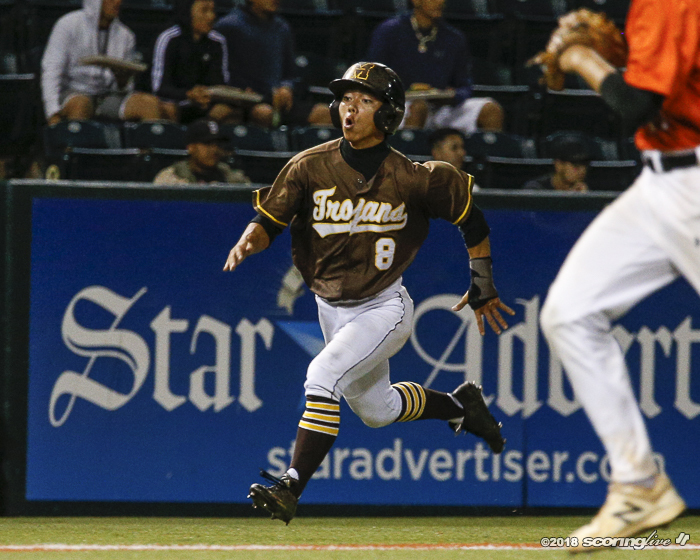 "We told everybody at the beginning of the year, everybody better be ready to go," Mililani coach Mark Hirayama said. 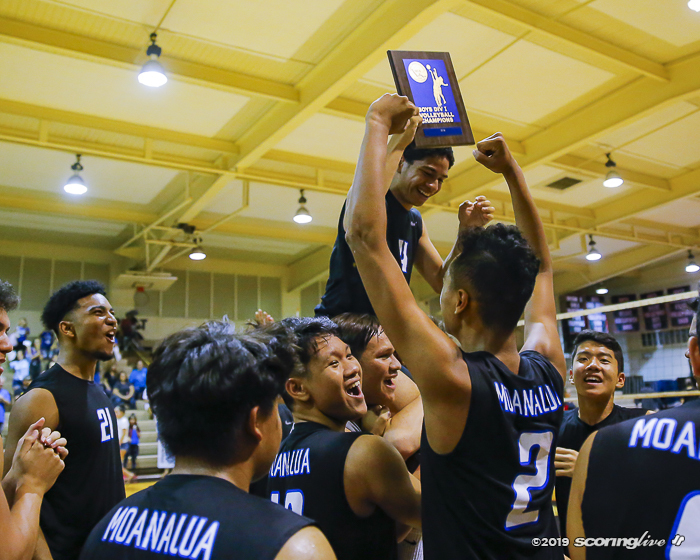 "You never know when you're going to get your shot, especially for us. 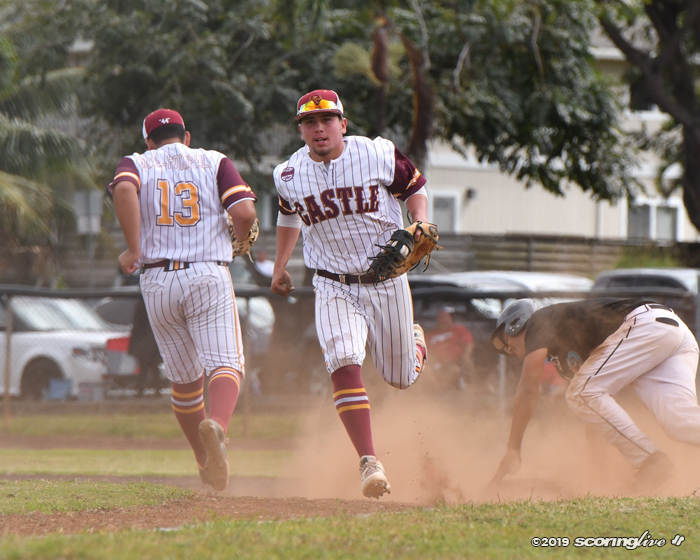 This is our third day (in a row) and we only play twice a week. 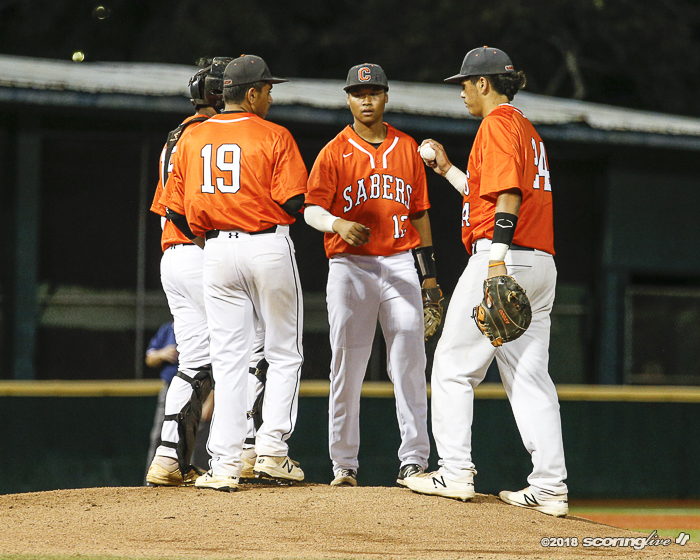 We hardly had time to get other guys ready." 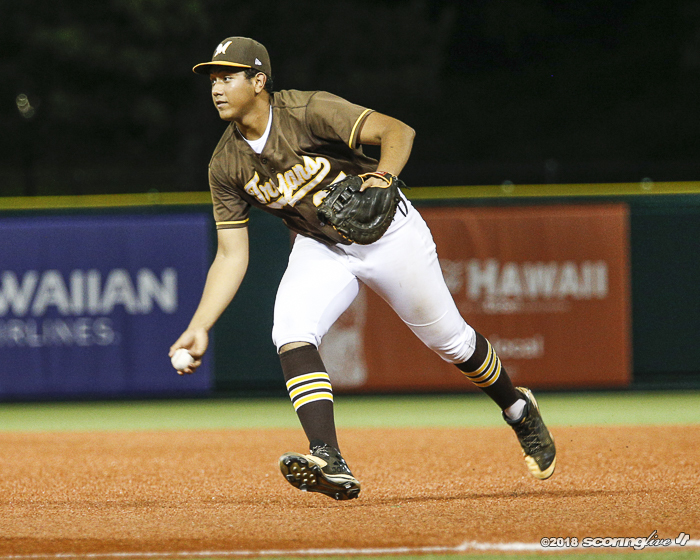 Entering the game, Mililani's three pitchers combined for 12 1/3 innings — 6 2/3 by Reis and 5 2/3 by Oshiro. 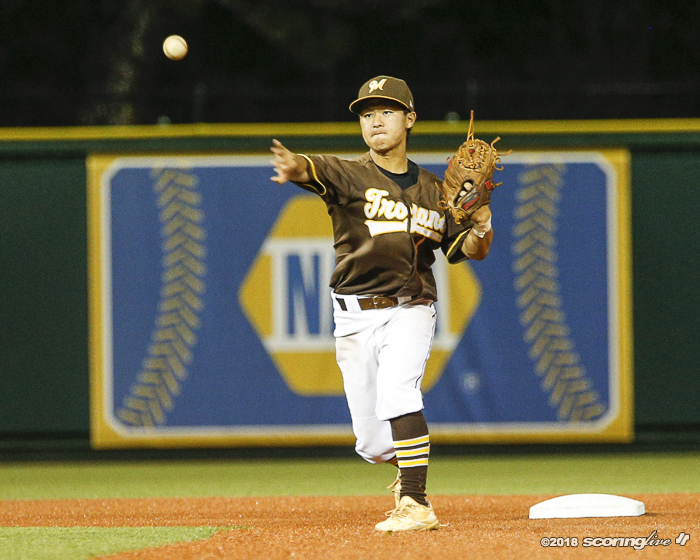 It was Pang's mound debut of the season. 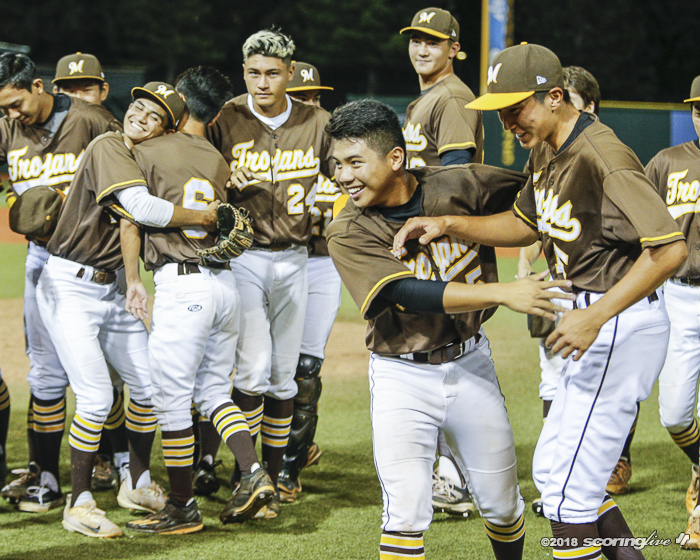 "For all the sophomores that stepped up today and Anu as a freshman, they just came out and did their thing," Trojans' center fielder Shea Yamaguchi said. 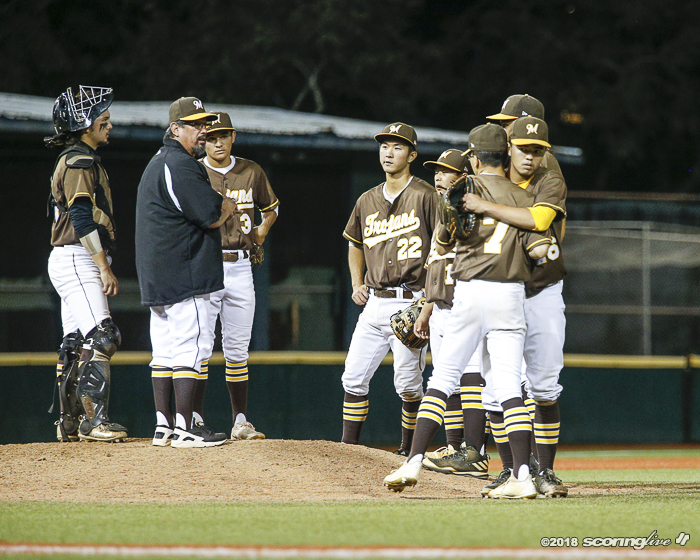 "Really proud of them." 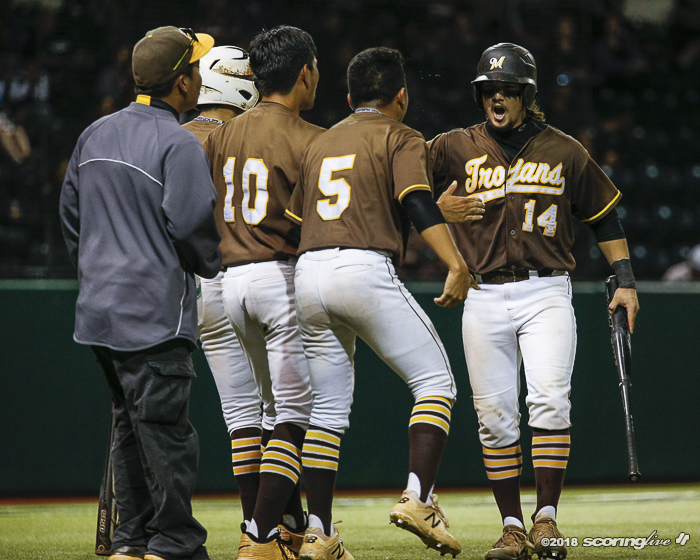 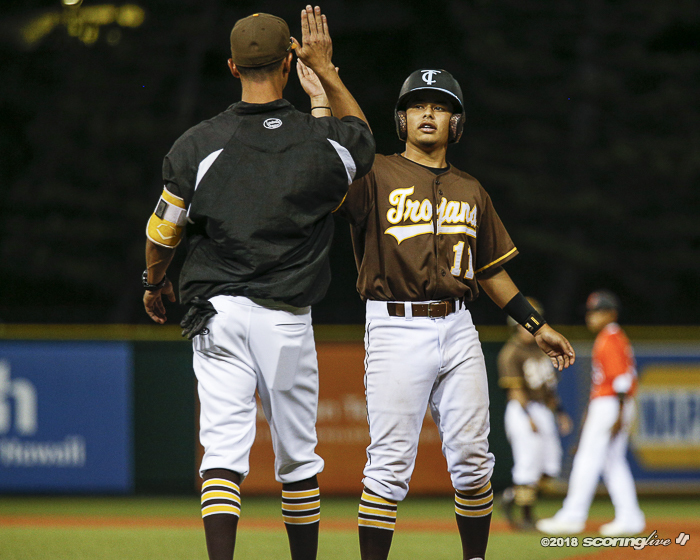 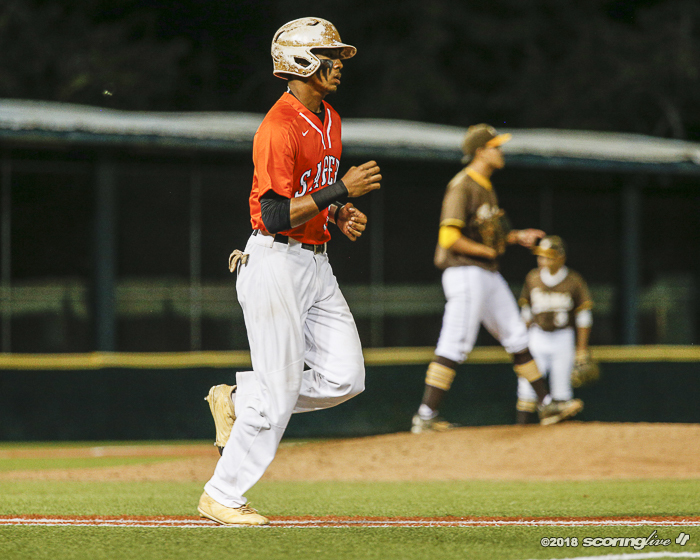 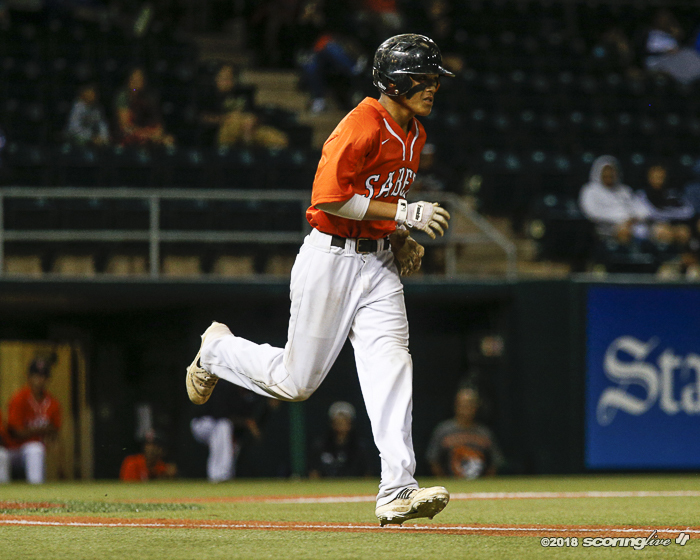 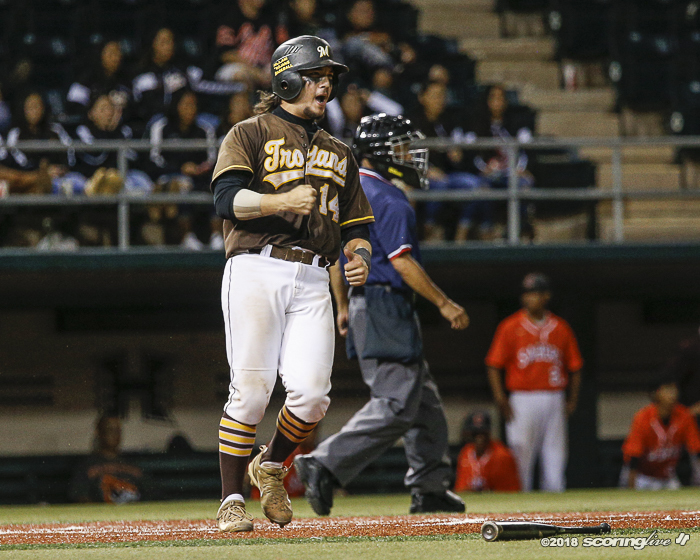 "They did what they needed to do," Campbell coach Rory Pico said of the Trojans' pitchers. 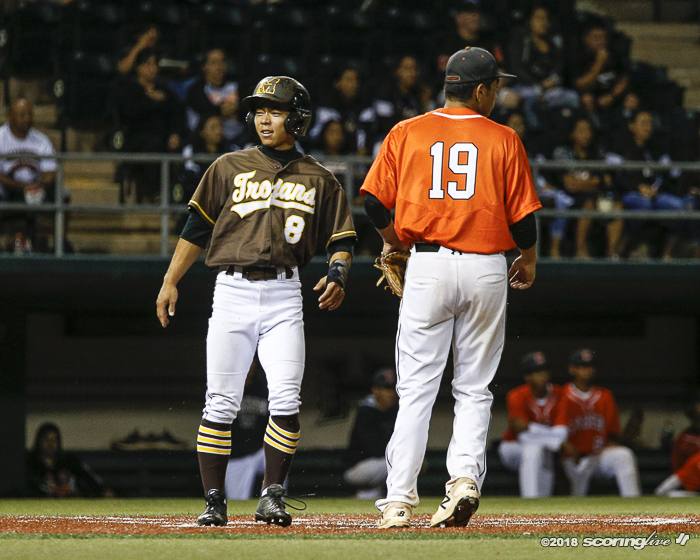 "Anu got into trouble that big inning, but (the Trojans) compete. 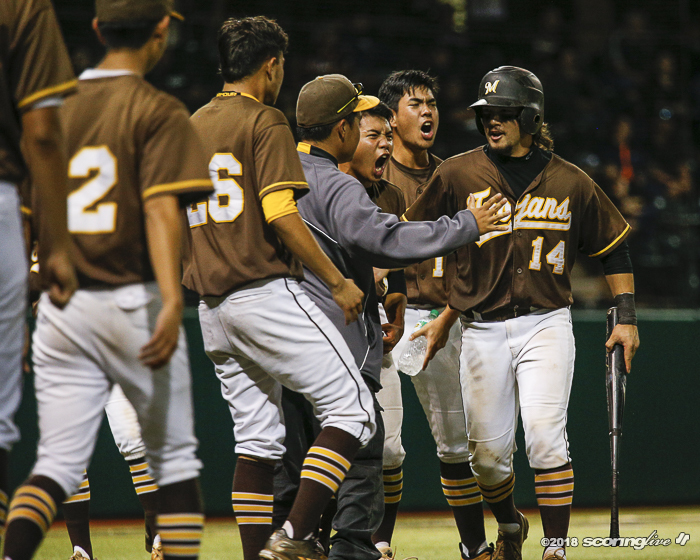 That's all you ask of your players that they compete, give it their all, do what they have to do, make adjustments. 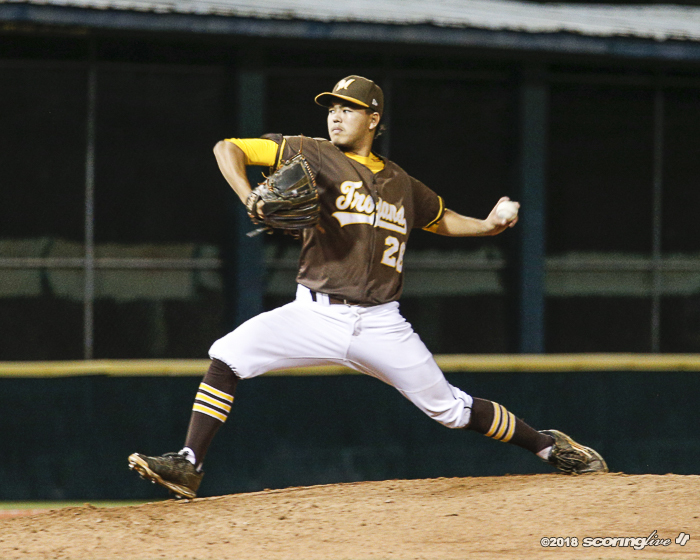 Those pitchers, they competed tonight." 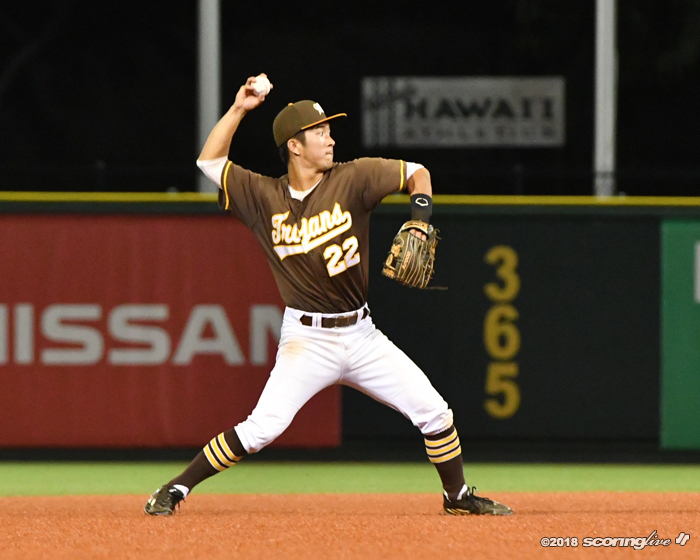 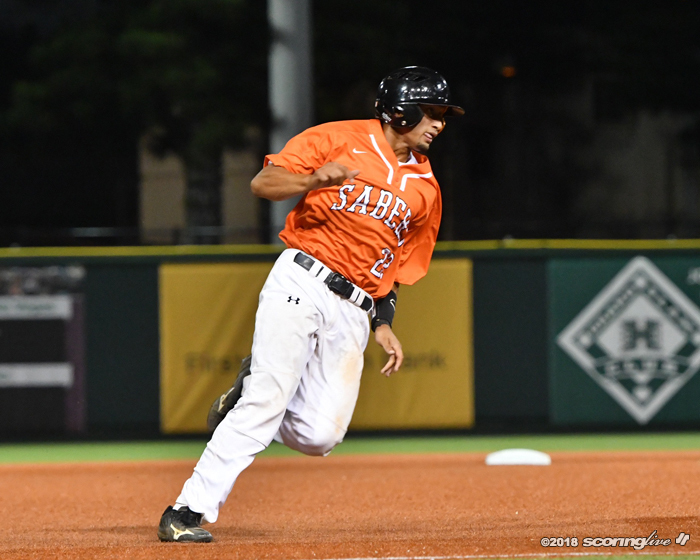 Yamaguchi, who bats leadoff, helped contribute to the offensive rally. 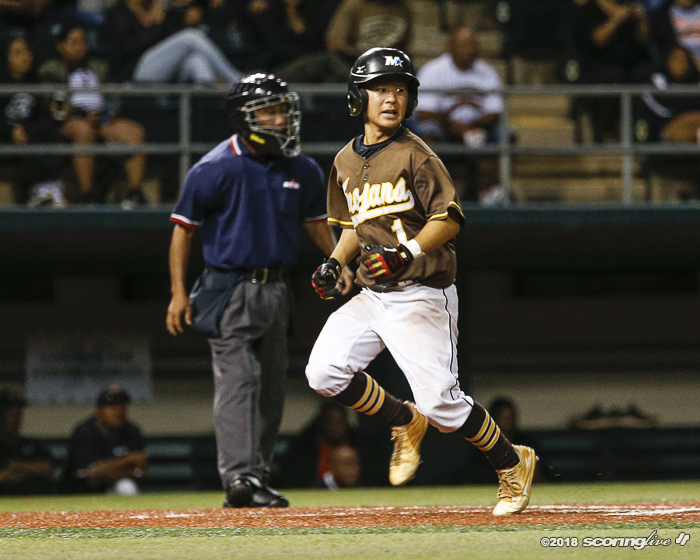 He reached safely three times — once on a single and twice on walks — and scored three times. 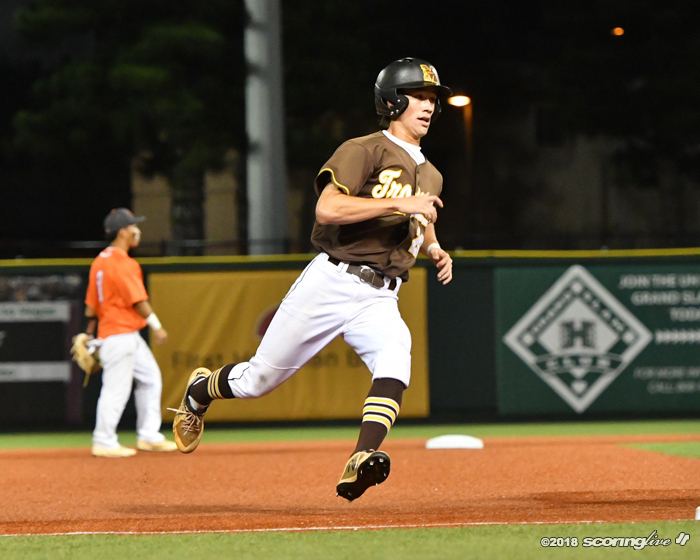 Beside his first plate appearance, he also led off in three other innings as well. 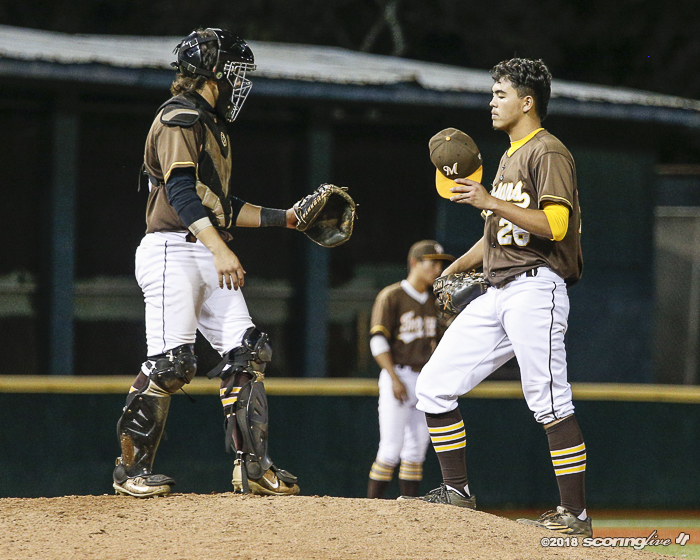 It was not a good night for the Robinson pitchers - not related - of Campbell. 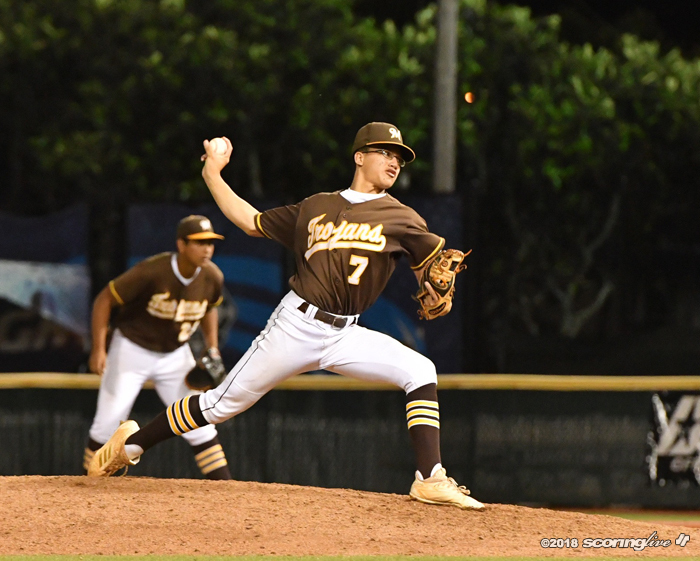 Sophomore Dayton started but lasted 2 2/3 innings, allowing three runs (two earned), two hits, a walk, hit two batters and threw a wild pitch that later hurt on a passed ball that scored a run. 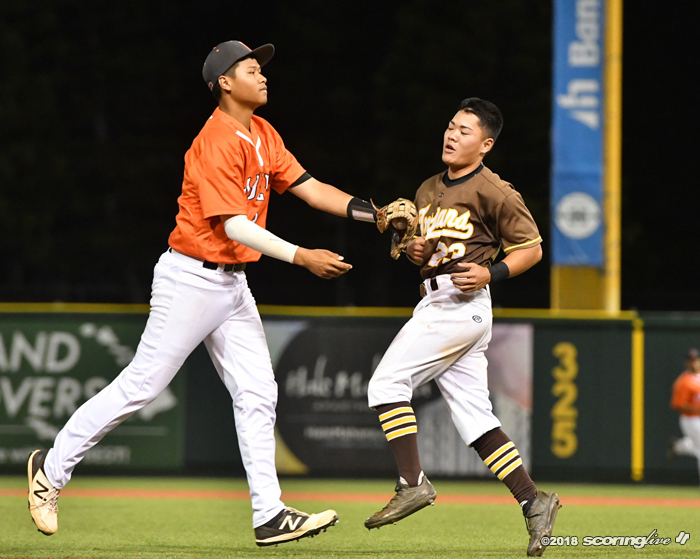 Darien, a senior, followed and pitched 1 1/3 scoreless frames but allowed a lead-off walk to Yamaguchi in the Trojans' three-run fifth. 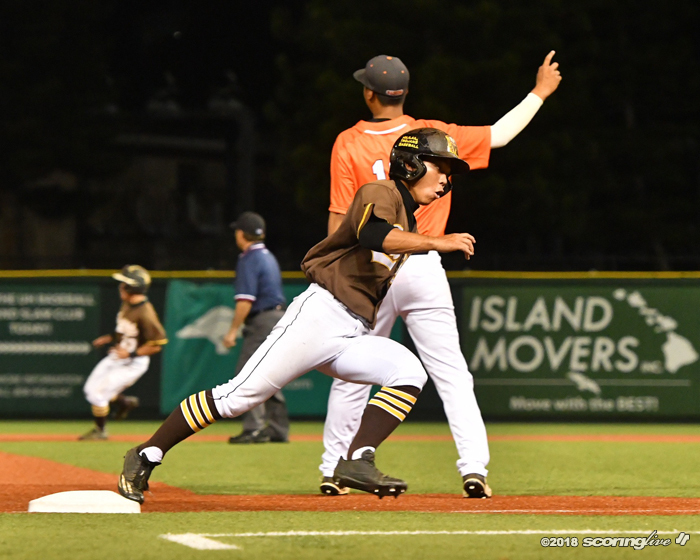 A catcher's interference put John Richard Suehisa on, and Korrey Siracusa was hit by a pitch to load the bases and end Darien's day on the mound. 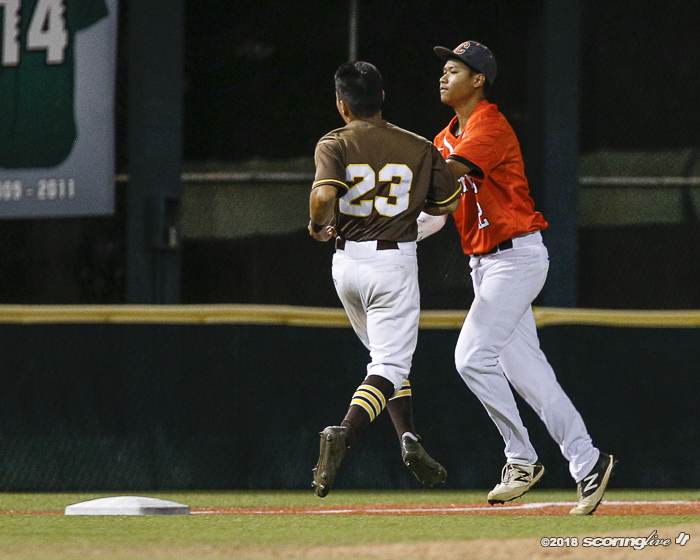 Logan Carvalho came in and hit Brycin Herrera to force in a run. 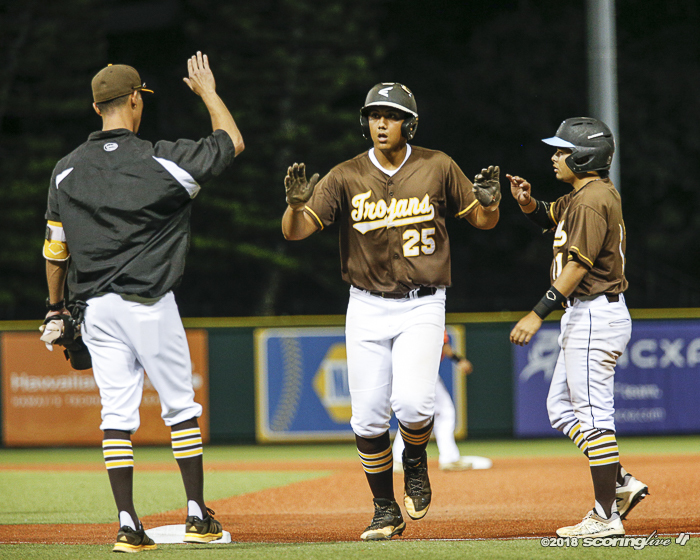 Noah Domogsac grounded into a force at second to score the tying run and Micah Kaohu's RBI single put the Trojans ahead, 6-5. 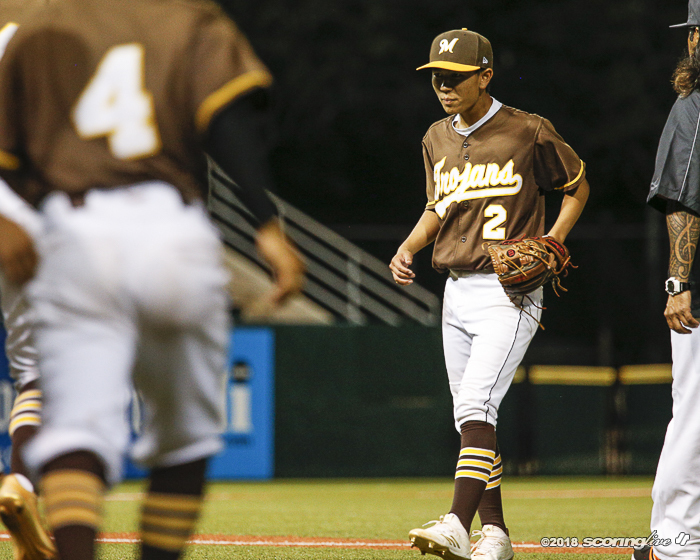 Freshman Tyrus Stephens came in and walked the first batter he faced but retired the next eight batters in a row. 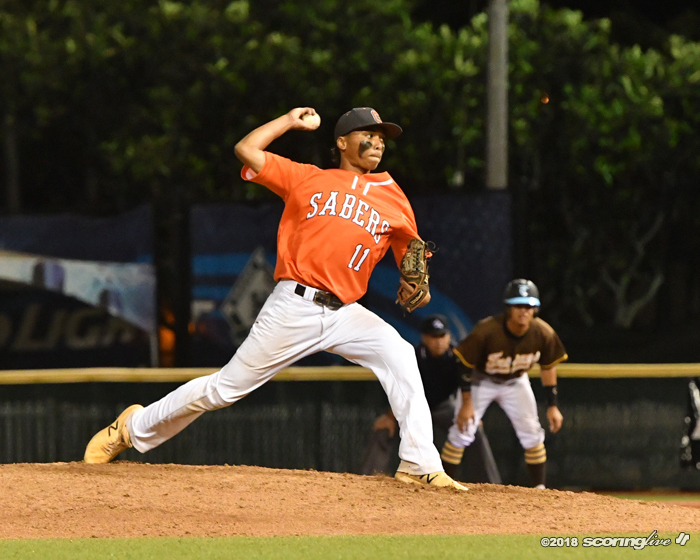 But Campbell could not solve Oshiro, who picked up the save. 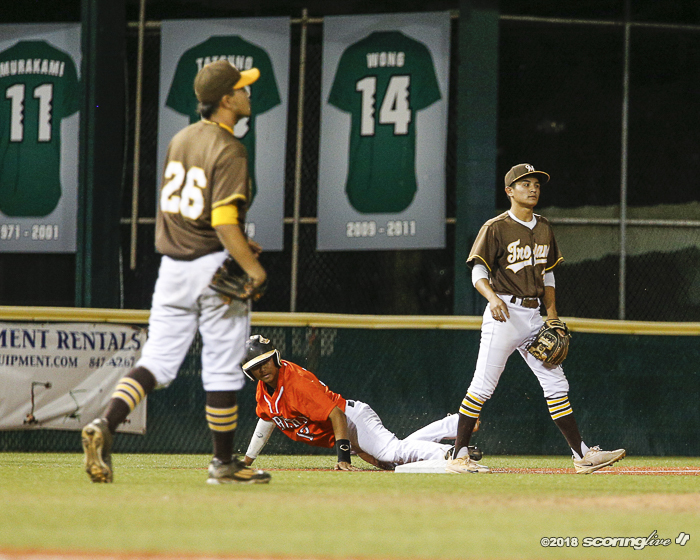 "Like coach said, young guys gotta step up and do your job. 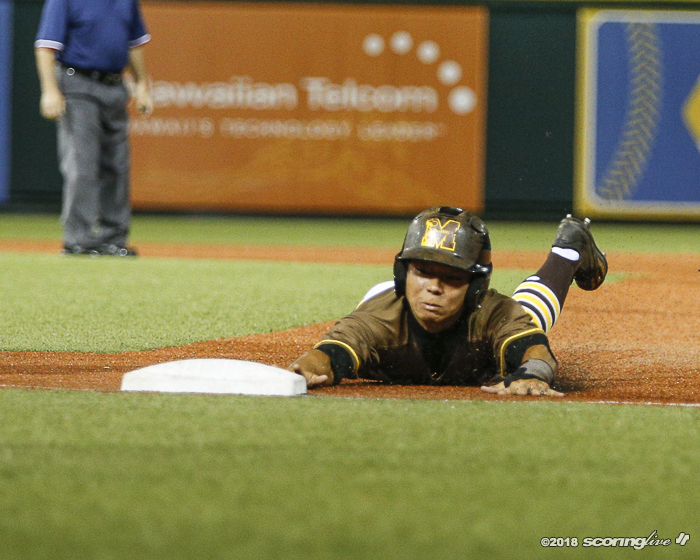 When it's our time, we have to contribute and do our job." 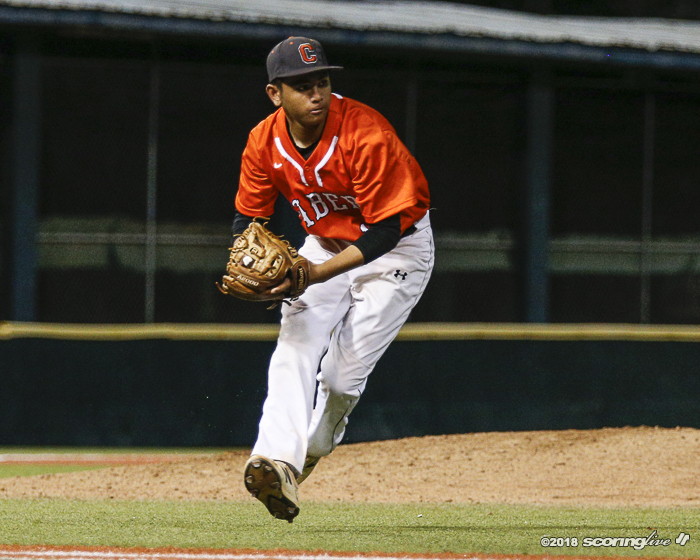 Ayzek Silva, who is 3-0 with one save and a 1.33 ERA, was Campbell's other starting pitcher. 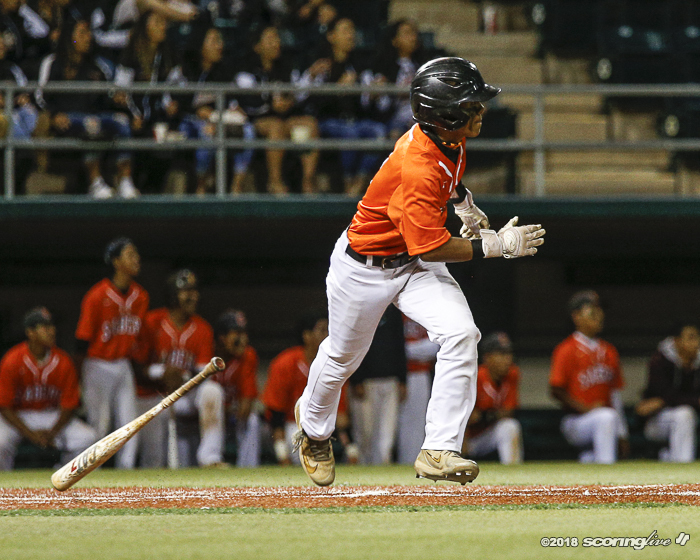 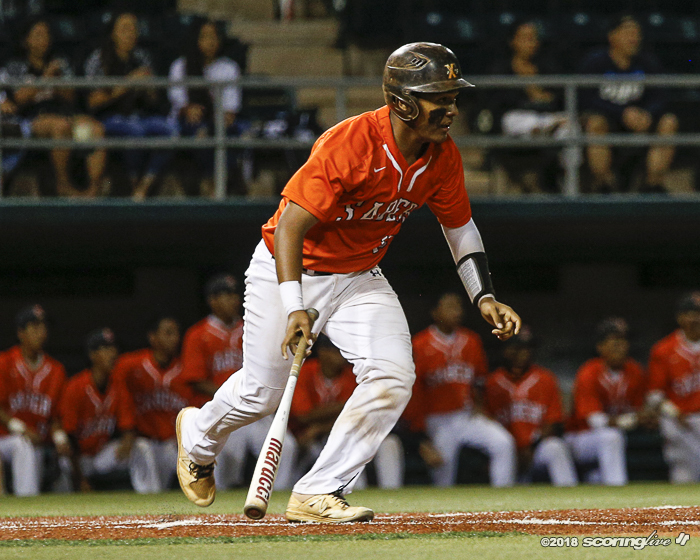 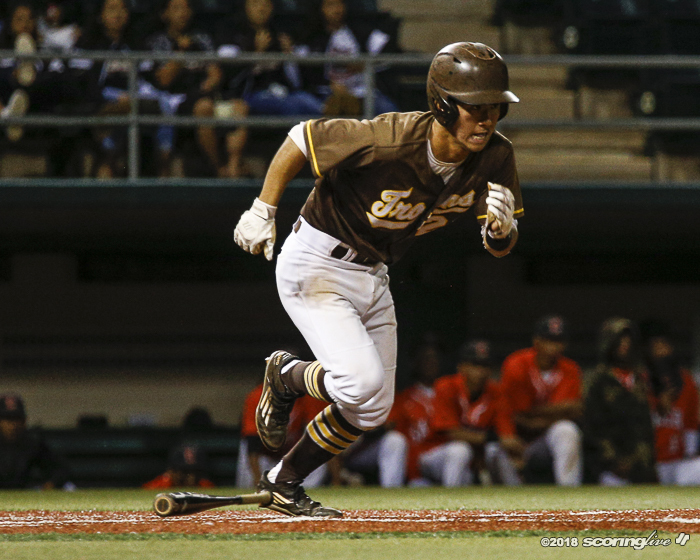 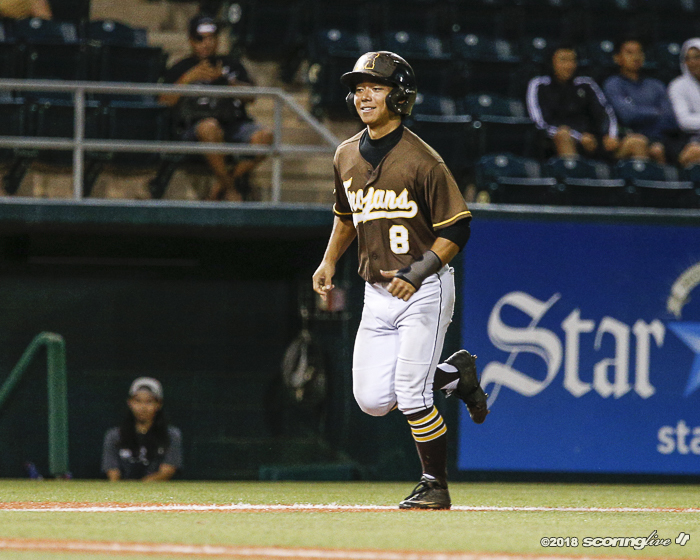 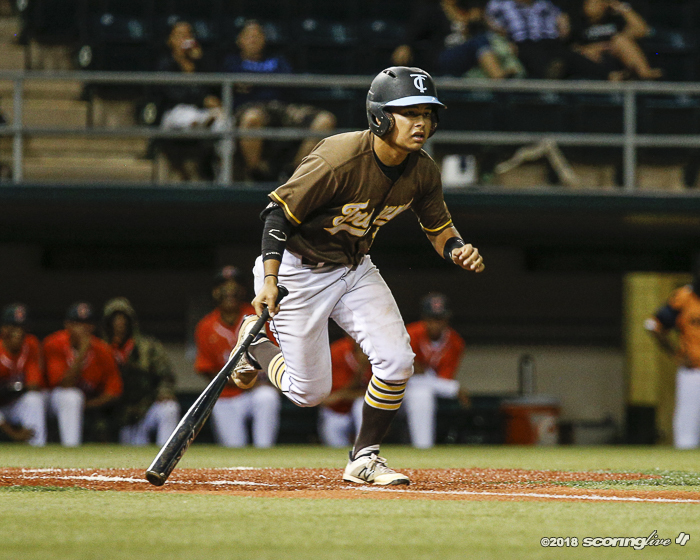 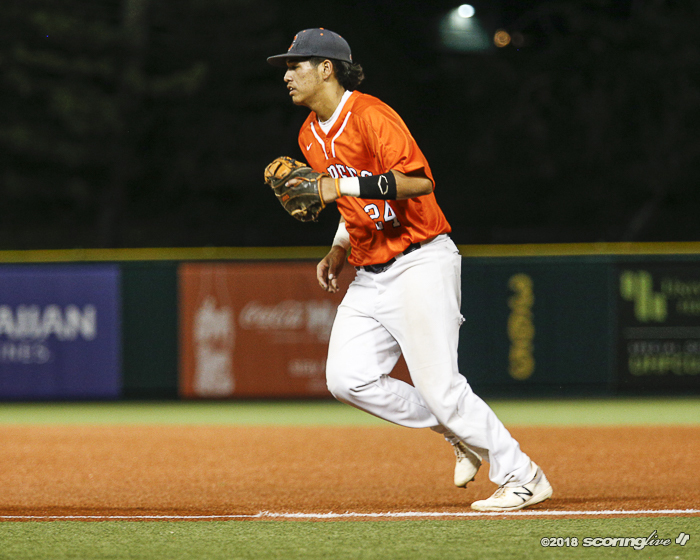 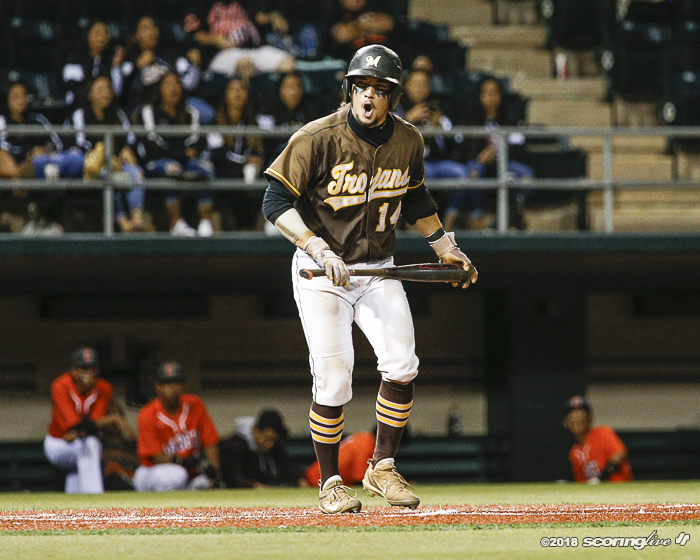 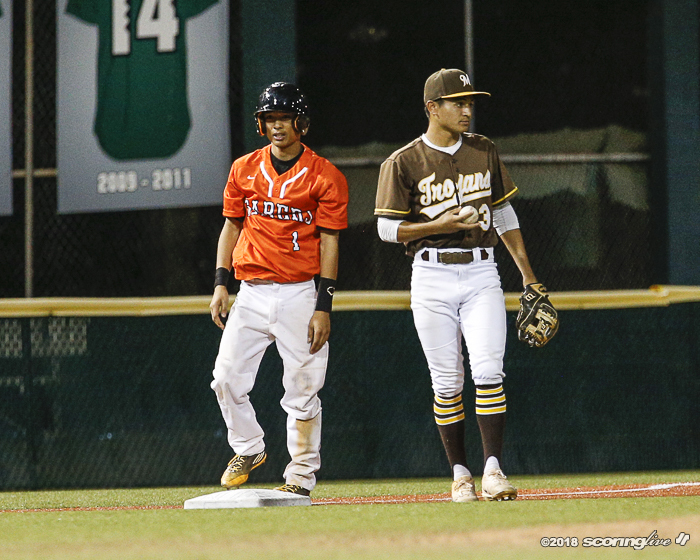 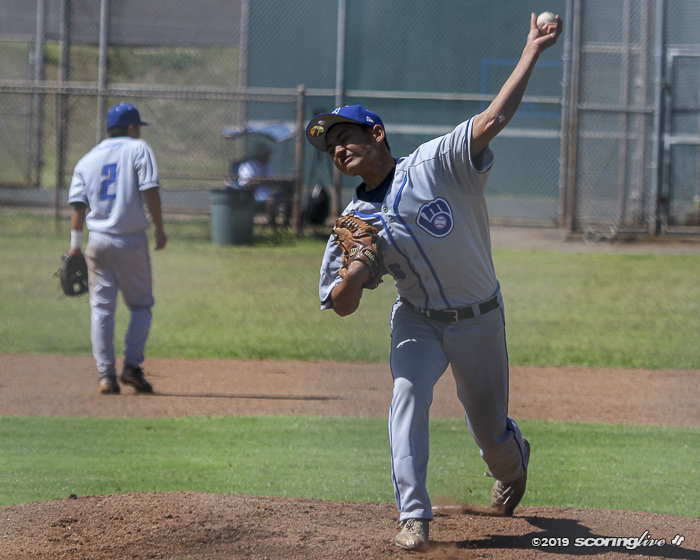 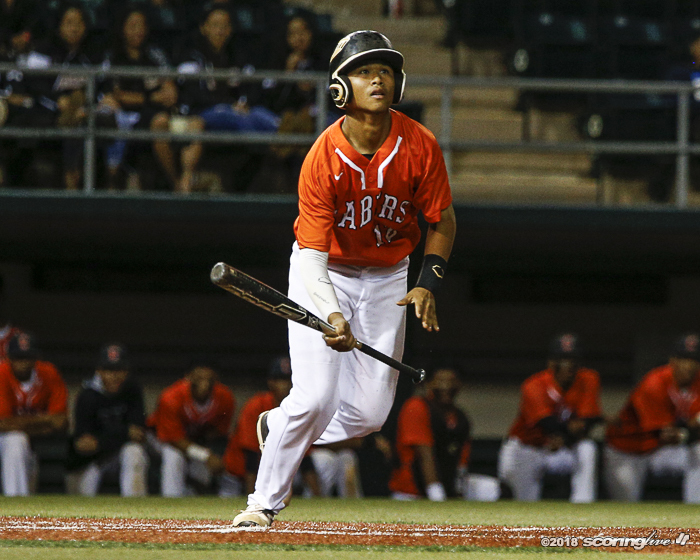 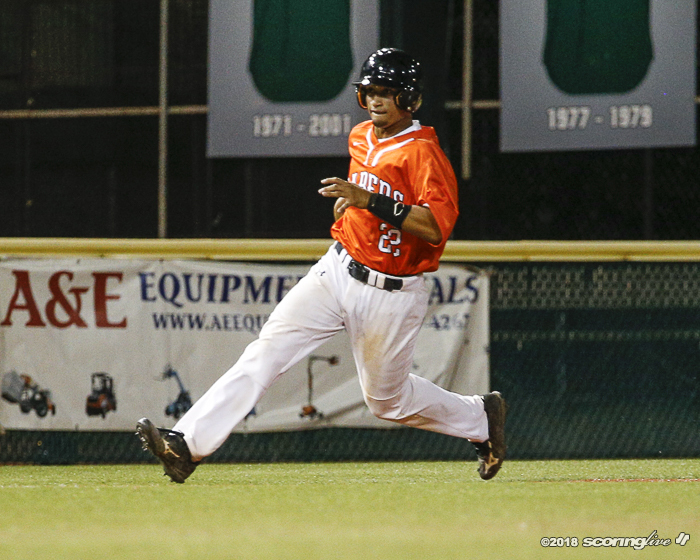 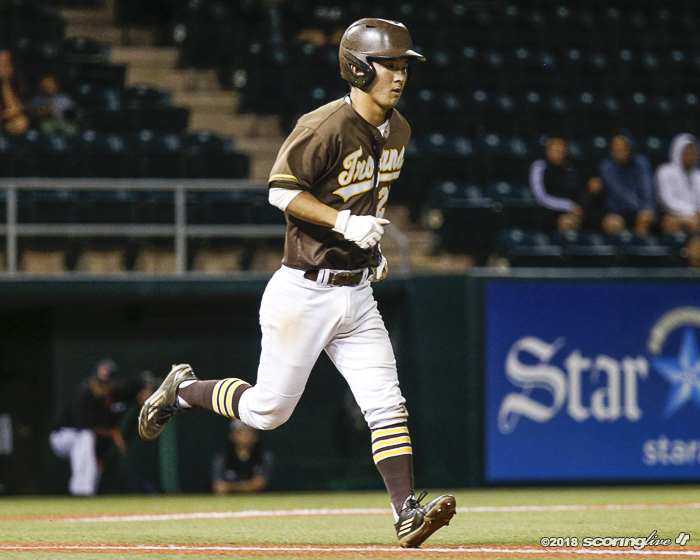 He had struggled in his previous outing, allowing three runs against Aiea without retiring a batter. 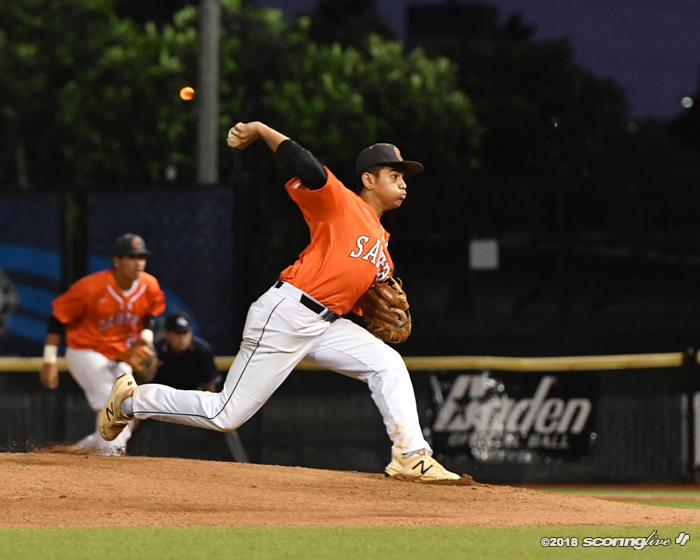 His ERA was 0.33 before that Aiea game. 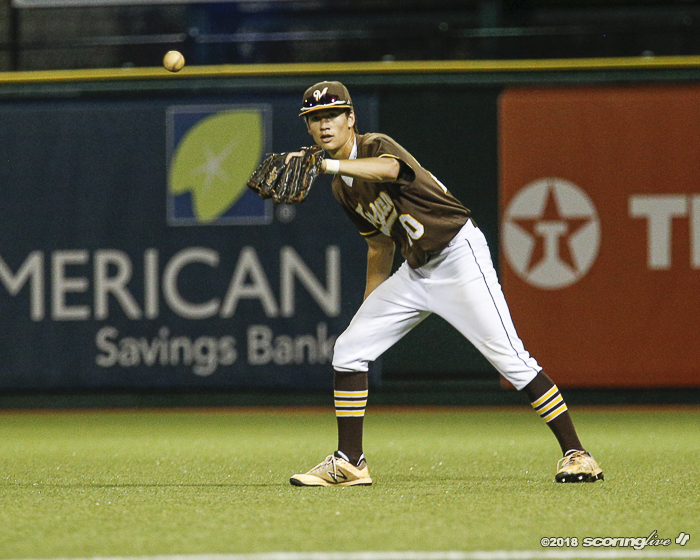 "Dayton is one of our starters; he actually was our No. 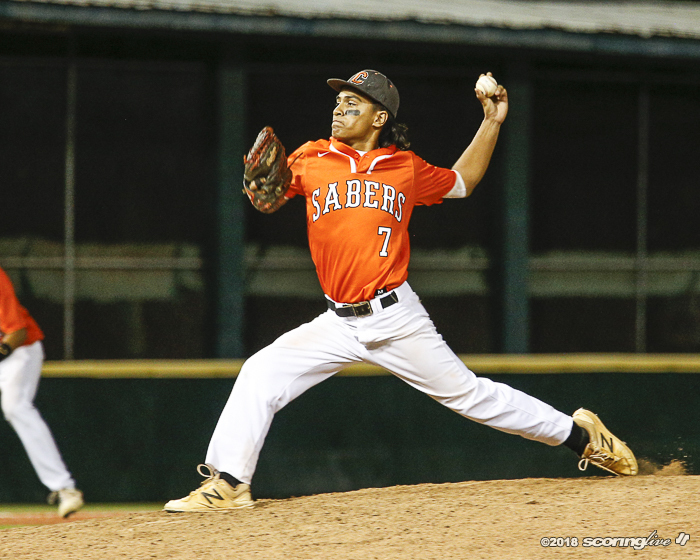 2 starter at the beginning of the year," Pico said "He threw well all year. 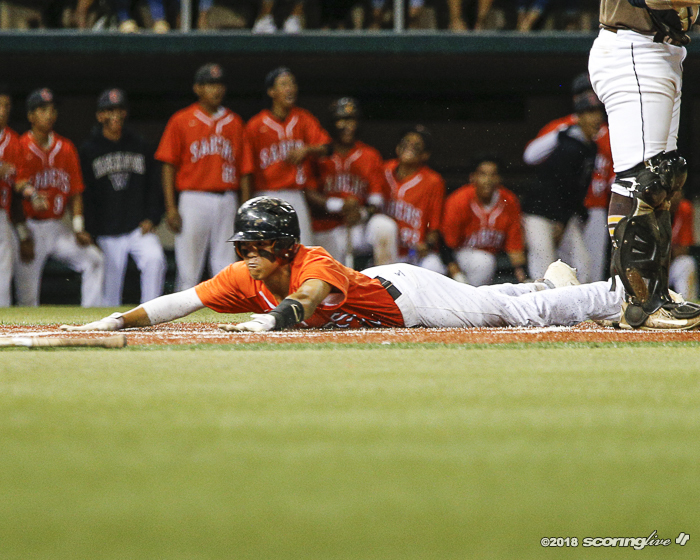 That's why we decided to go with him." 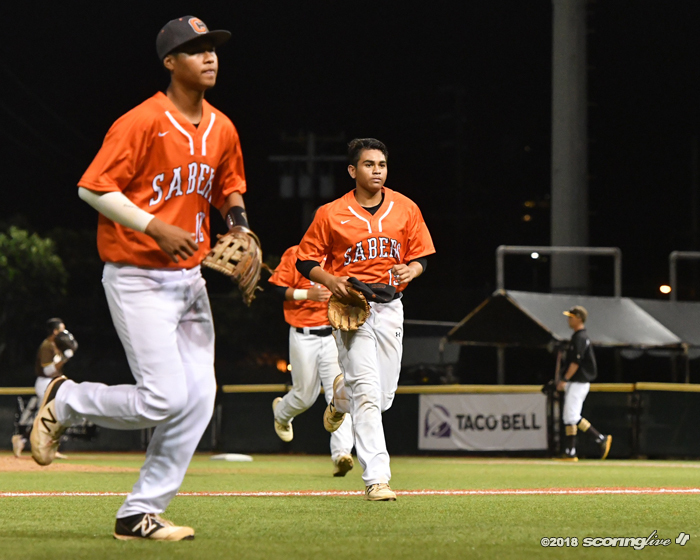 The six runs allowed was the most allowed by the Sabers all season, yet they only lost by one run. 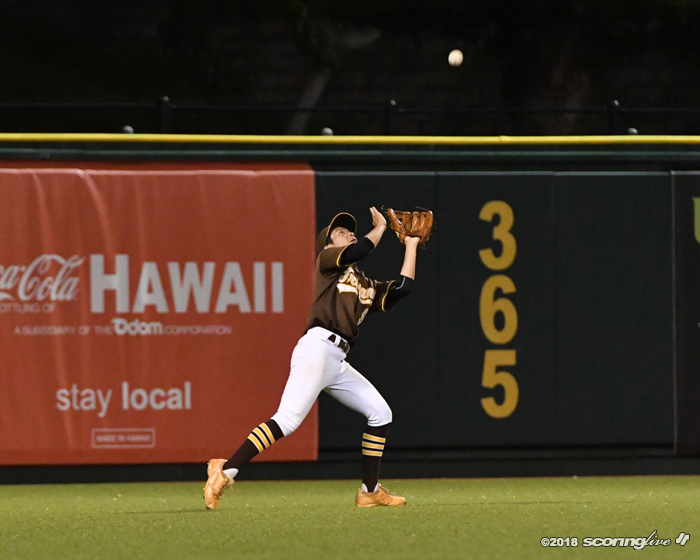 Campbell also fielded a young team with sophomore Zachary Palipti at second base and Ansley Issacs-Costa pinch hitting and remaining in the game in right field. 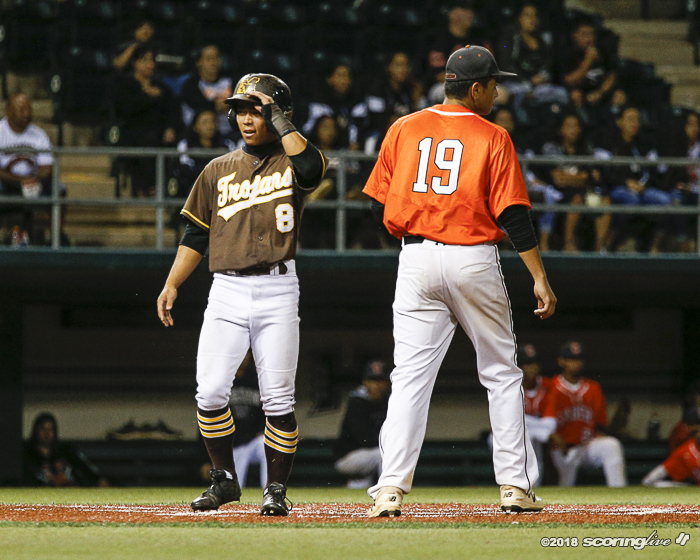 "Don't get me wrong, Mililani played a great game," Pico said. 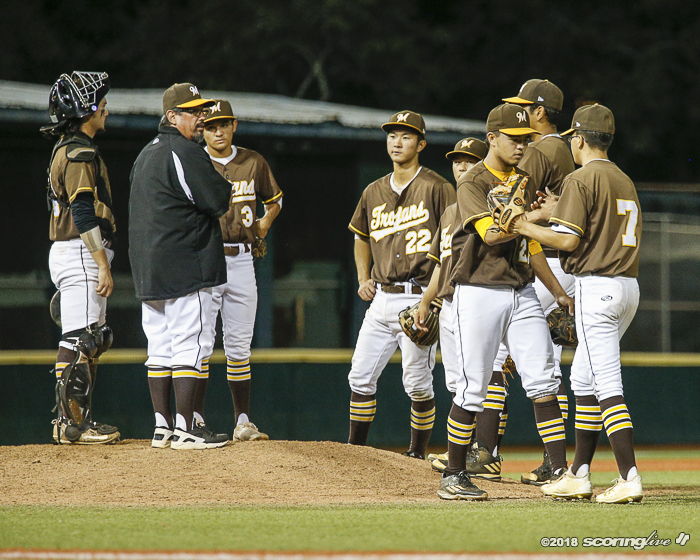 "For some of us, the lack of experience in this kind of atmosphere, it took us a little bit of time to adjust. 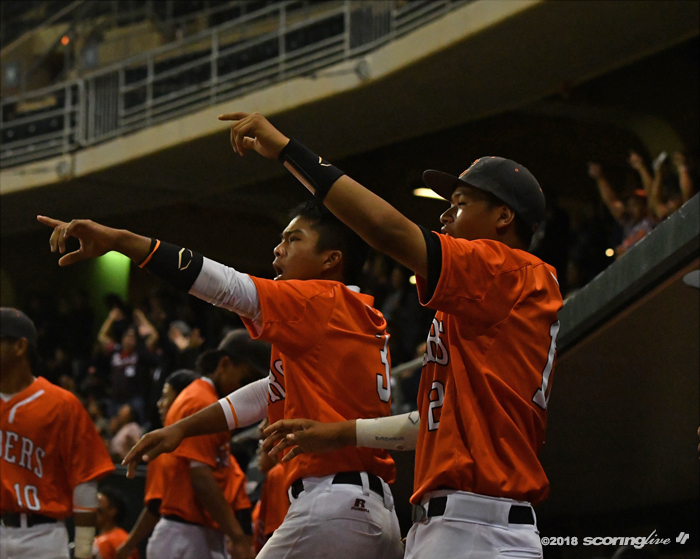 I have to do a better job of preparing them for this kind of atmosphere. 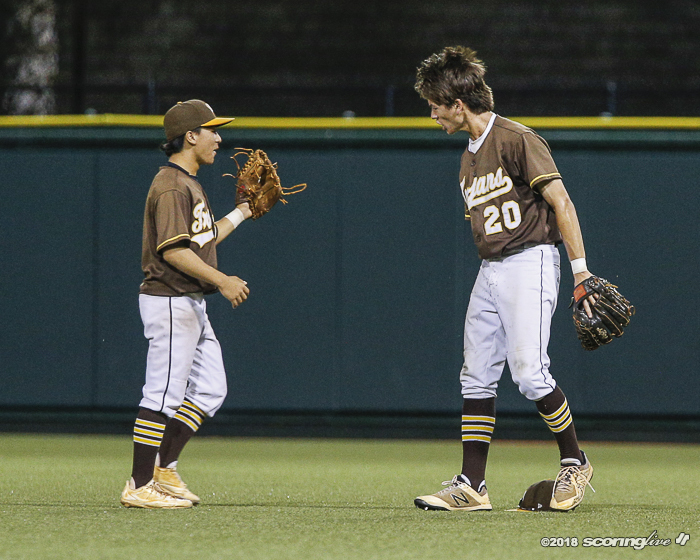 Guys performed after they settled down. 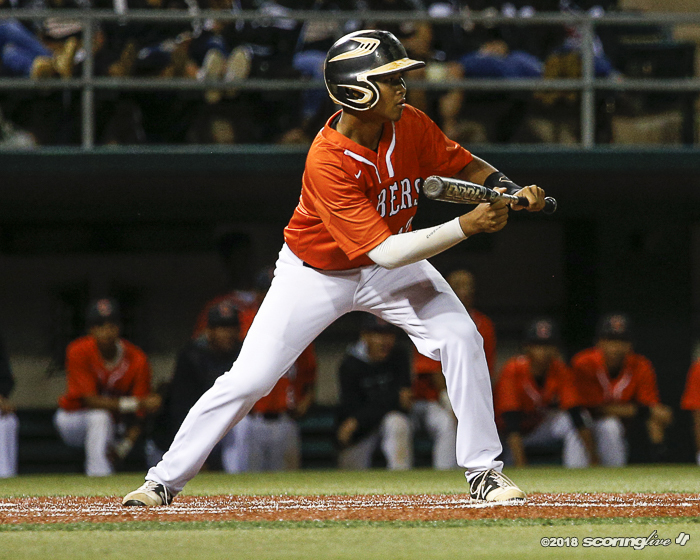 This is something we gotta use to make us better in the future." 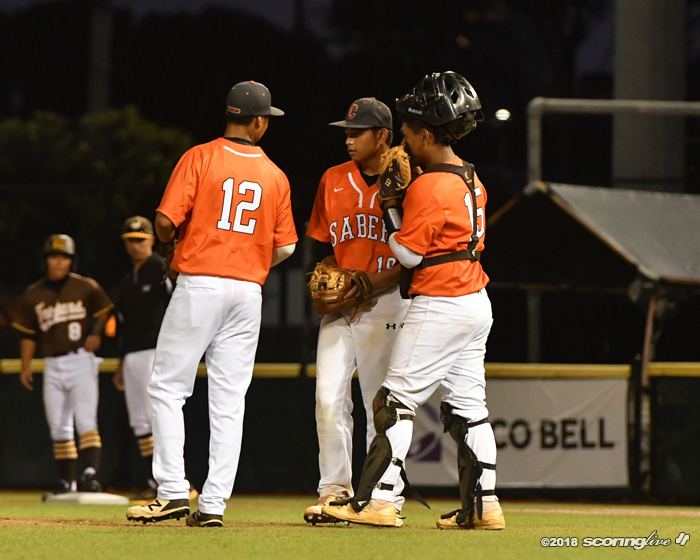 The future is not that far. 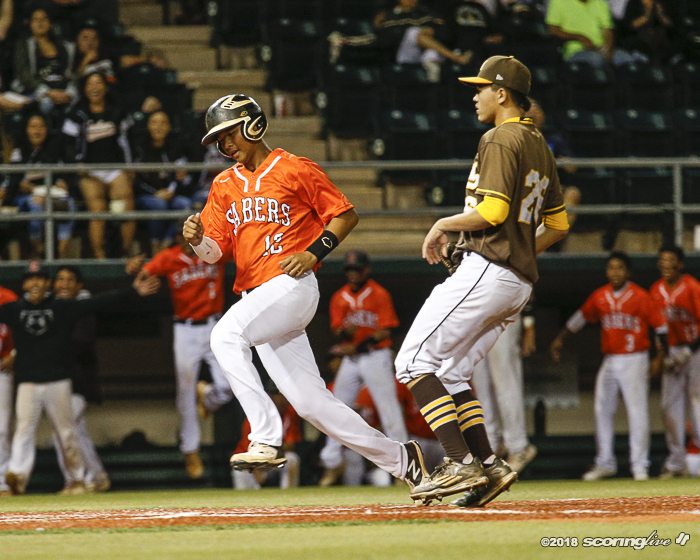 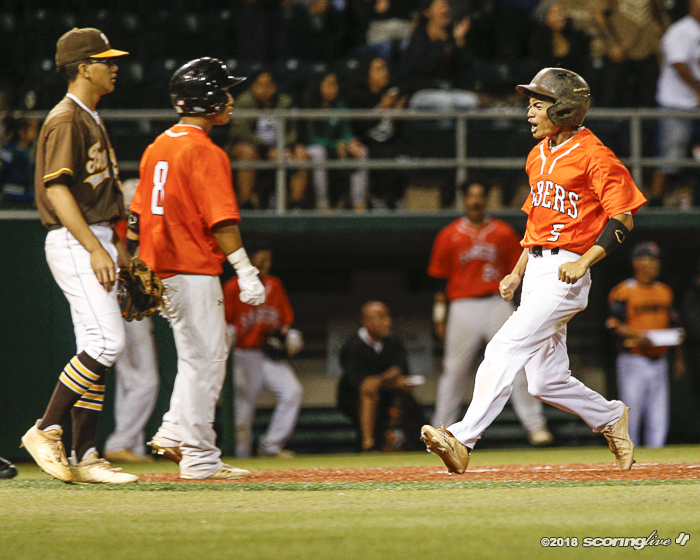 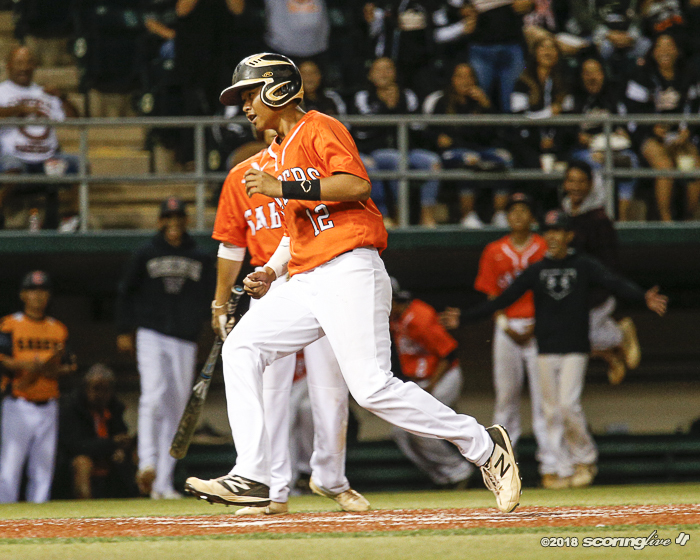 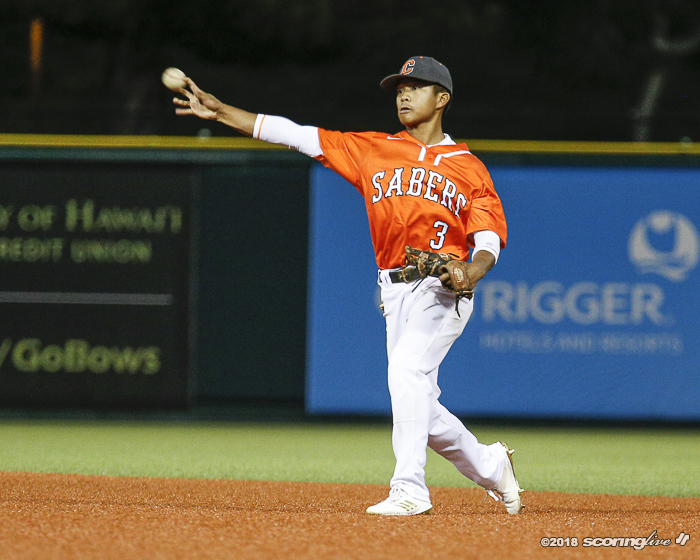 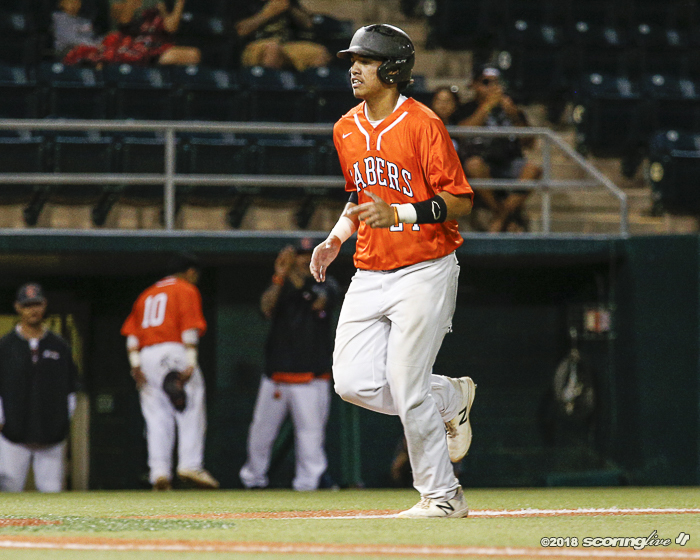 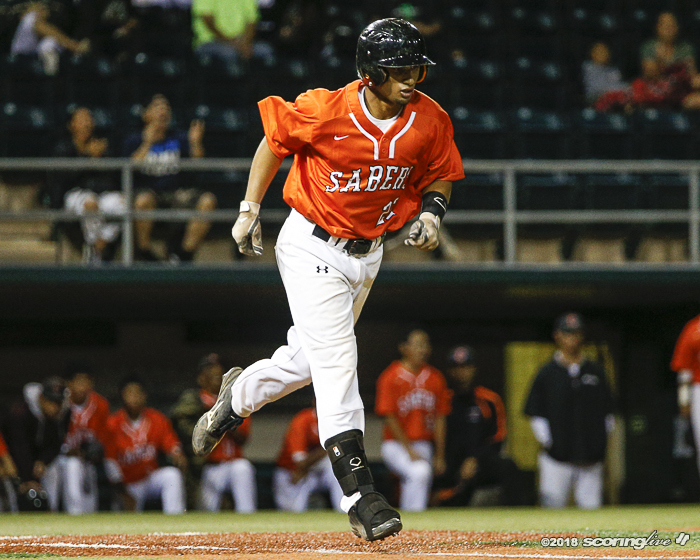 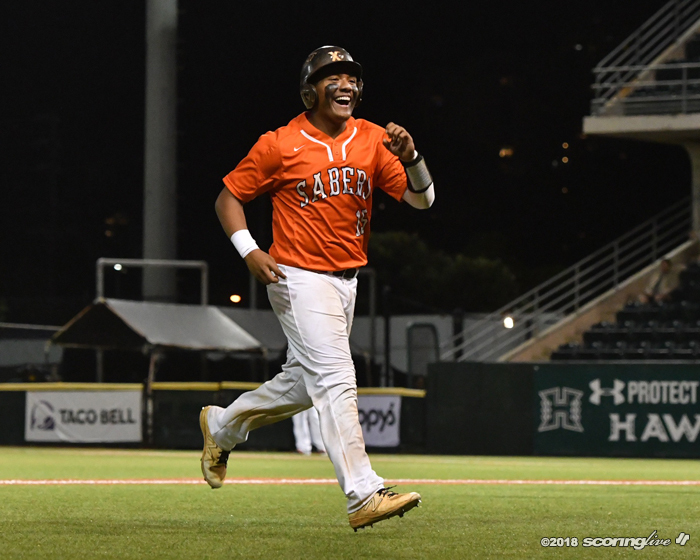 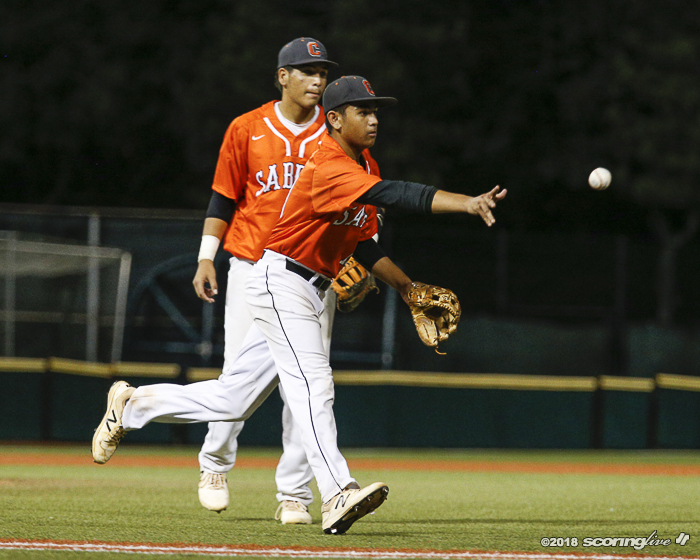 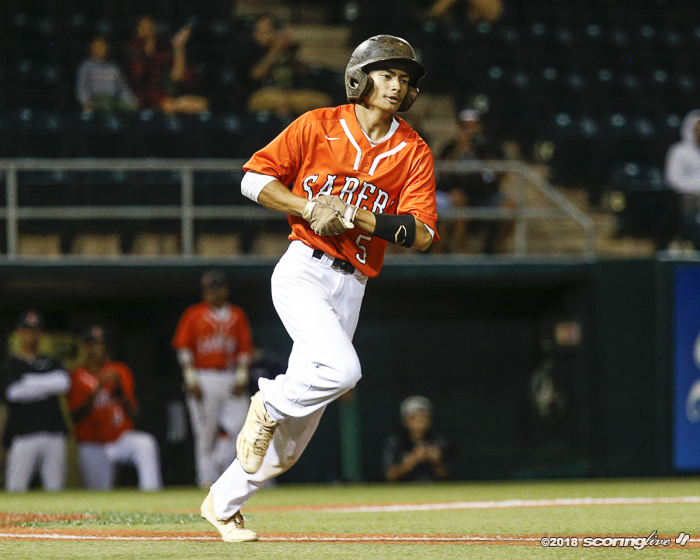 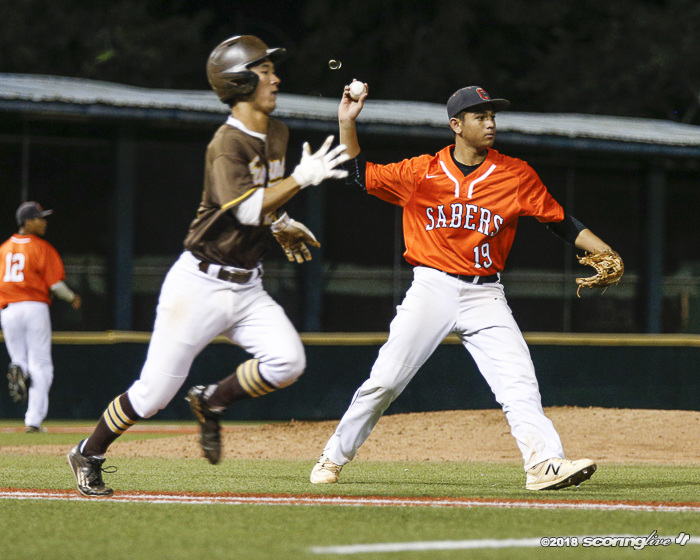 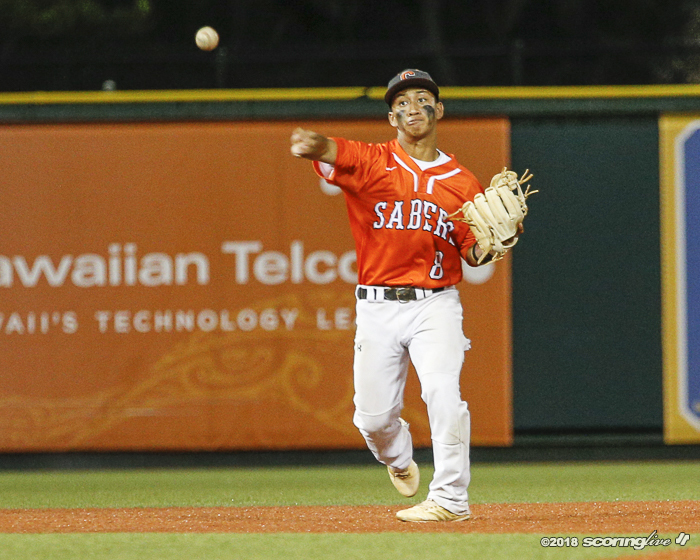 The Sabers, as well as Pearl City, Kailua and Mililani are headed for the state tournament. 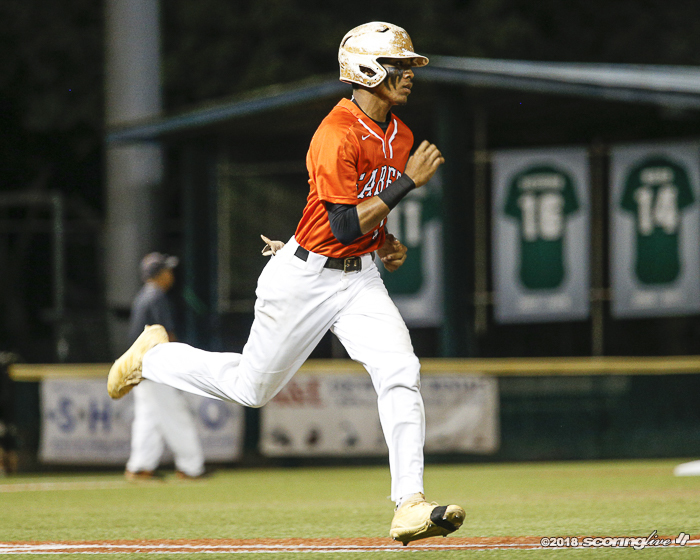 Campbell will host Pearl City for third place in the OIA Saturday.